On Saturday the 30th of September 2014, 11 of our students competed at the 6th Annual Friendship Games held in Primrose, Johannesburg. It was a long stressful day for all of us but we managed to win a total of 25 medals over all- 15 Gold, 8 silver and 2 bronze. We started early Saturday morning with patterns winning, 6 gold, 2 silver and 2 bronze medals. It was the first time we competed in couple’s patterns but we still managed gold and two silver medals in this event. In the sparring we managed to win another 6 medals while special techniques and power braking made up the last 3 medals of our total. It was a well-organized and fun competition and we’re looking forward to the next Annual Friendship Games to be held next year! Hopefully more of our Club’s members will be able to participate in this event! 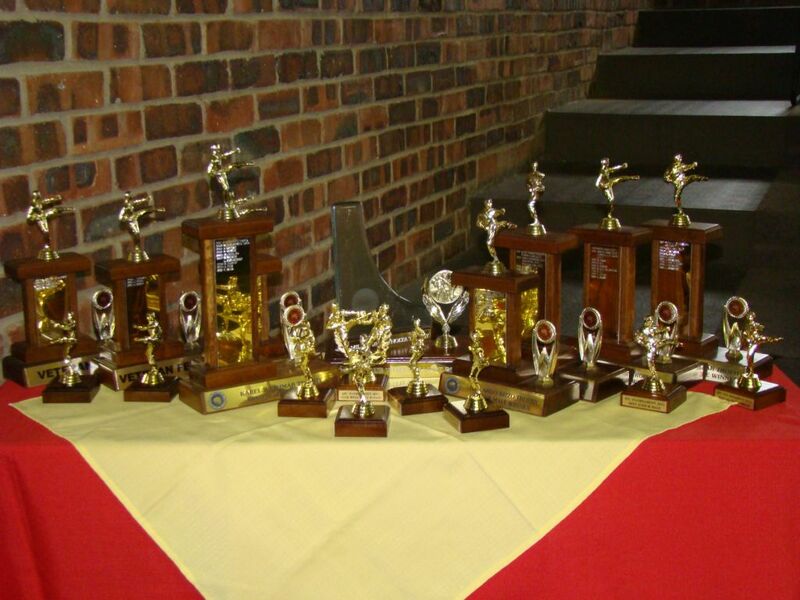 On the 19th of July 2014 the Gauteng North and Northern Provinces Tournament took place in the Denis Adami Hall, Pretoria. The tournament began on time, ended ahead of schedule and was once again a huge success! 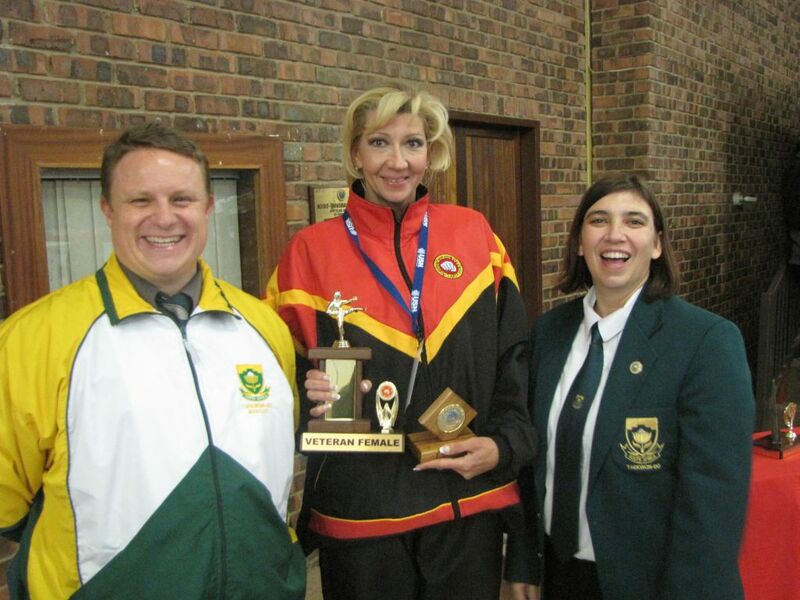 We thank all the instructors, black belts and senior belts that assisted with umpiring and admin through-out the day. We congratulate all the participants who won medals and in doing so qualified for Gauteng North colours, approved by the Tshwane Sport Council! 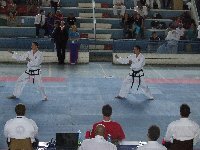 On the 21st of June 2014 the Byongae Taekwon-Do Club hosted their first Invitational tournament in Boskruin, Johannesburg. A handful of ATC students from the Cullinan and Elardus Park dojangs braved this very cold Highveld winters morning to participate in this newly launched annual tournament. With only 13 students participating, ATC managed to end 3rd overall on the scoreboard. Congratulations and well done to all the ATC students on yet another great tournament result! Early morning on a very cold 31 May 2014, competitors, umpires and supporters gathered at the North Gauteng Wrestle Hall in Pretoria for the 13th ATC Invitational Tournament. Competition was friendly but fierce, with ATC emerging as the clear winners at the end of the day. 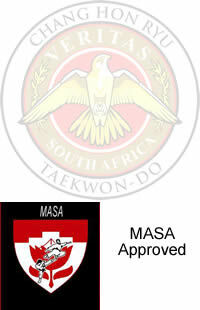 The Taekwon-do Centre came in second with Magua Taekwon-do a close third. The Tournament was a big success and everyone thoroughly enjoyed themselves. As always thanks to Sbm Karel and Annari Wethmar for organising a fantastic tournament. The battle cry echoes over rough fields lacerated with oozing streams, slippery obstacles and sludge. The eye is inexorably drawn to a vast, tortorous avenue of mud molasses. The very aptly named Mud Monster. An energy sapping 100m of oozing, sucking mud, it really feels as if the monster is trying to devour you. And then you get to the first 3m high hill of slippery mud. Blood, sweat, tears, mud, foot in face, knee in ribs, struggling, flailing, VICTORY! The team is over the hill! Our elation is short lived. The courage nose-dives and joins the plummeting energy reserves. In front of us, another sea of mud, another slippery clay hill. Our team of 7 inseparable (and indistiguishably muddy) ATC warriors climbed over walls, crawled under barbed wire, through mud, over gravel, through ice water, eventually conquering all 15 obstacles. Bring on the next one, 1-2 March! In December 2013 ATC hosted its 2nd annual holiday photo competition. ATC students could enter by submitting photos of themselves training Taekwon-Do wherever they might find themselves over the December holidays. The 2013 winner was Theorentia Veldsman with photos of her performing kicks at the Eiffel Tower in Paris, France. Theorentia won the price of one month’s free training at ATC with her stunning photos in the cold of Northern hemisphere! People chatting, warm fire and a sizzling steak on the grill made for a perfect evening. The year-end function once again arrived! The theme for this year’s year-end function was “Silly hats”. Prizes were up for grabs to those with the silliest hats worn on the evening. We all gathered at the Meadow Rigde clubhouse for a fun and festive evening on Friday 22nd of November. The year-end function is always a great way to get to know your fellow students and participants in our beloved art of Taekwon-Do. But the fun stops when the trophies starts to find their owners! Tension and hope fills the conversations. Judges decide which hat is the silliest and sorry to those who were not wearing hats! 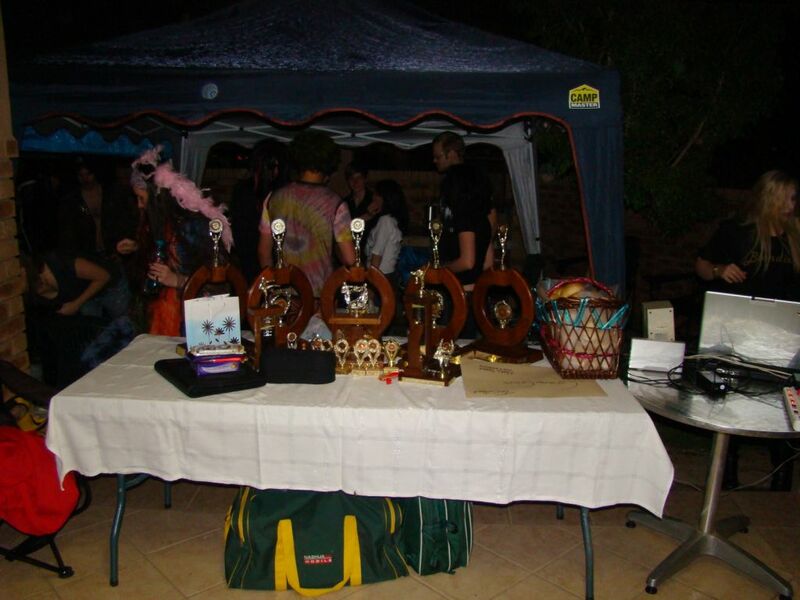 The floating trophies found their way to deserving ATC students that gave their all during the year. Please click here to see a full list of all the Annual Floating Trophy winners. 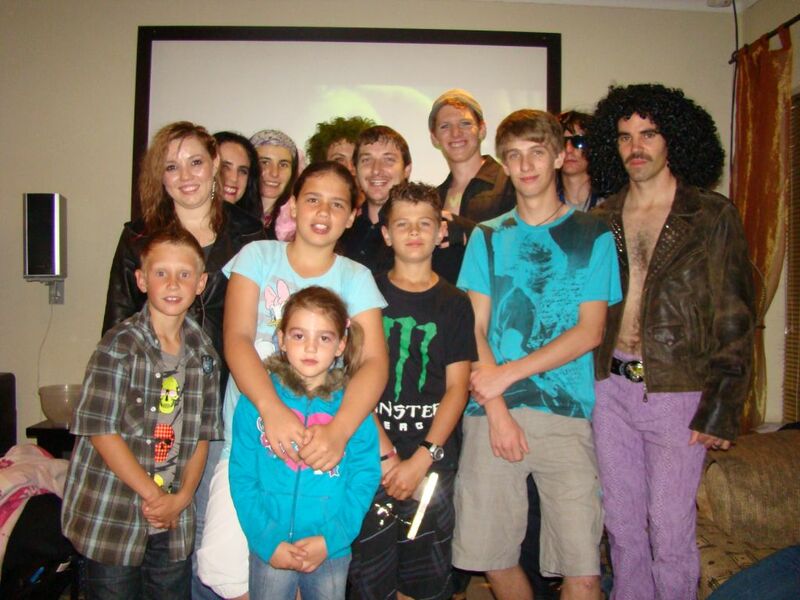 The year-end function was once again a huge success and served as a kick start to 2014! It promises to be a successful and competitive year! 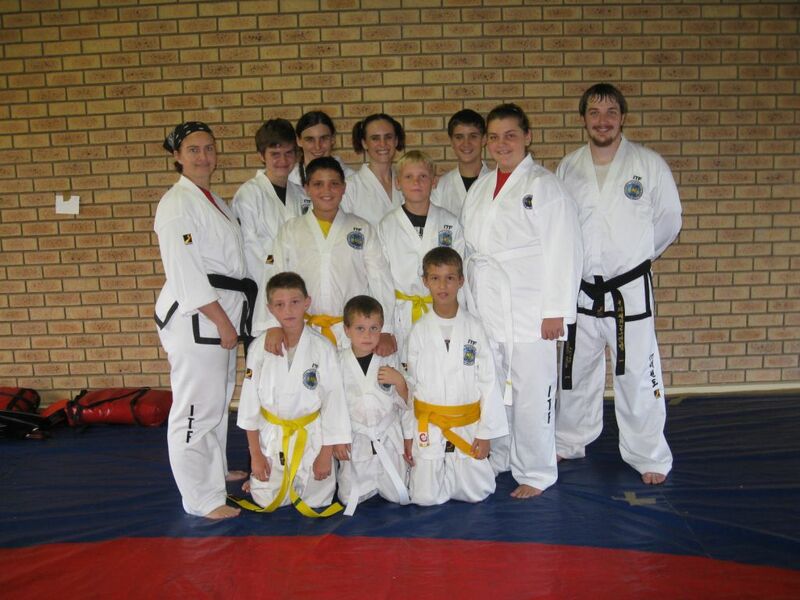 A colour belt and black belt grading was held at the Elardus Park dojang on Saturday 30 November 2013. All colour belt students that graded passed their testing while one student, Danniëll Botes, graded to 1st degree black belt under Sabums Karel & Annari Wethmar. During the second session, visiting examiner Sabum Justin Glanville presided over the third and fourth degree black belt grading. 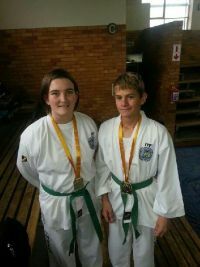 Manie Naude graded to 4th degree black belt, while Isabel Potgieter and Stefan van der Linde both graded to 3rd degree black belt. Despite the gruelling physical and mental tests endured by all, the results were favourable. We look forward to a action-packed 2014! 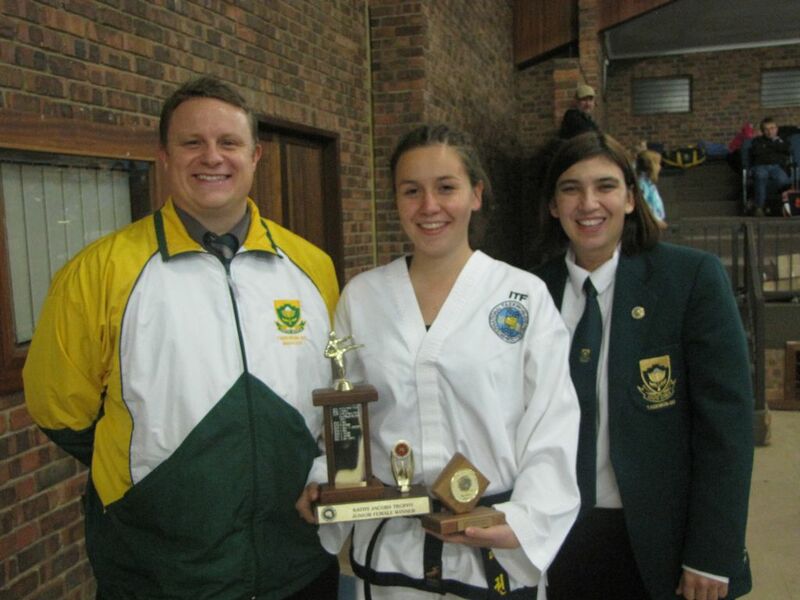 Eleven students from ATC participated in a Taekwon-Do demonstration for MENSA on Wednesday 7 November 2013 at the Pretoria High School Old Boys Club (PHSOB), which is the world’s oldest and most prestigious high-IQ society. Bsb. Gustav Gous kicked off proceedings by giving a brief speech about Taekwon-Do, which highlighted its scientifically derived nature and the elements that make it unique as a martial art. Once that had been concluded, the fun began. 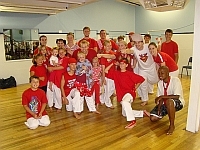 The demo team performed two team patterns; one by the black belts and one by the colour belts. This was followed by a demonstration sparring match, delivered by Bsb. 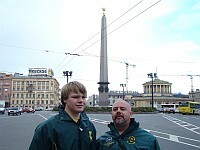 Gustav Gous and Bsb. Arnu Nepgen. Even though the contact was kept light, they delivered a blindingly fast display that kept the crowd on the edge of their seats. This was followed by a power breaking display. 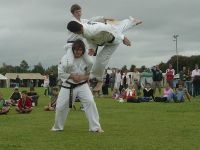 A number of students showed off their skills, both with ground-based power breaking and aerial techniques. Finally, Bsb. 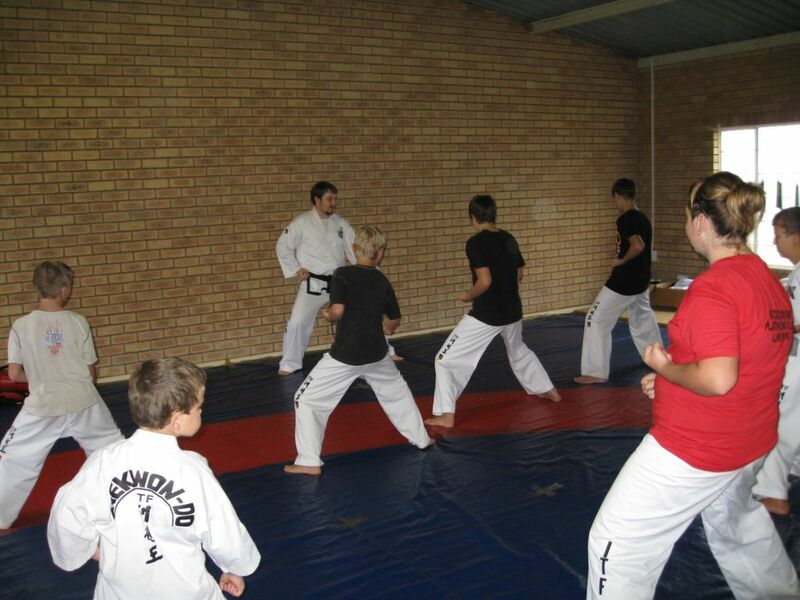 Manie Naude conducted a short self-defence seminar that allowed for some voluntary participation from the audience. Overall, both the demonstration participants and the audience had a great time. It was a most successful evening. Early morning 19th of October, and the annual 2013 ATC Open tournament was about to start in the Denis Adami Hall, Queesnwood, Pretoria. Competitors were very exited and nervous, but confident at the same time. The morning went well with final arrangements, registrations and umpire briefing. 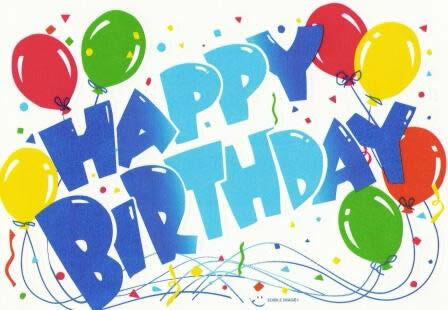 Two of the participents Adrian van der Merwe and Roland Resseguier both from The Taekwondo Centre in Johannesburg, celebrated their birthdays on the day. This says a lot of their dedication to the art and sport to spend their birthday doing what they love and enjoy. 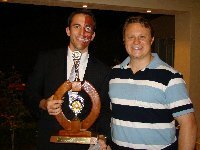 Congratulations to ATC that won the trophy for the club with the most points. Once again, the 2nd in a series of Pretoria landmark themed medals, the Union Buildings, were impressive and something to be proud of. The day was a great success thanks to participation of all the various clubs. The day could not have been such a great success without the orginised planning and execution, hard work and dedication of sabum Karel and sabum Annari Wethmar. A BIG thank you must go to all the instructors and black belts that assisted during the day with umpiring and also to the family and friends that supported us on the day. A special word of thanks to Friedrich Miessner for the use of his bakkie to transport all the tournament mats to and from the venue. At the tuckshop food and drinks sold like hot cakes from early morning, all thanks to Juanita Boonzaaier, Marius and Louise Hanekom, Chris and Liza du Plessis and Nanda Brits. The boerewors rolls were a great success thanks to the two Jaco’s on the braai taking care of the boerewors. These were the people that gave their time and energy to work in the tuckshop and to keep the customers happy. Thanks to all for making this day such a great success and we look forward to the next tournament! Spring has sprung and so the 4th Chang Hon Ryu (CHR) Championships took place in Johannesburg from the 20th to 22nd September 2013. Apart from this event being the recognized national selections tournament for the purposes of applications for National Colours by SASCOC/MASA, it will also crown the overall South African Champions in all categories of the traditional Chang Hon Ryu style of Taekwon-Do for 2013. This was the ultimate championship event for this sport and art in South Africa. The Floating trophies for the category Tigers and the categories Juniors, Adults and Veterans were awarded to the National Federations that scored the most points during the tournament. A great day was had by all who participated. We look forward to the next CHR tournament scheduled for October next year! The umpire seminar held on 24 August 2013, run by Sabums Karel and Annari Wethmar, was unique in the history of the SA-ITF. Black belts and senior colour belts gathered from all over Gauteng in the Elardus Park Do-Jang in order to learn all that is necessary to run a Taekwondo tournament. Even though the seminar was scheduled last for eight hours or so, this was barely enough time to absorb all the information that was given to us. The first session in the morning covered everything involved in the basic running of a tournament, from establishing a budget to hiring medics. This was followed by an in depth tutorial on how to draw up bracketing sheets fairly (a much more complicated procedure than one would first think). Finally, in the afternoon, we learned how to perform all of the roles typically filled by senior black belts at tournaments, from the centre referee to the jury president. This included a theory briefing as well as a practical session, where we were able to test our new found knowledge first hand. At the end of the day, we were awarded certificates that show that the seminar participants are now competent to function in the majority of support roles that may be found at any normal Taekwondo tournament. It was hard work, but extremely enlightening and every person there walked away, not only with new knowledge, but a new-found respect for the intricacies of tournament design and function. It was, all in all, a most impressive experience. 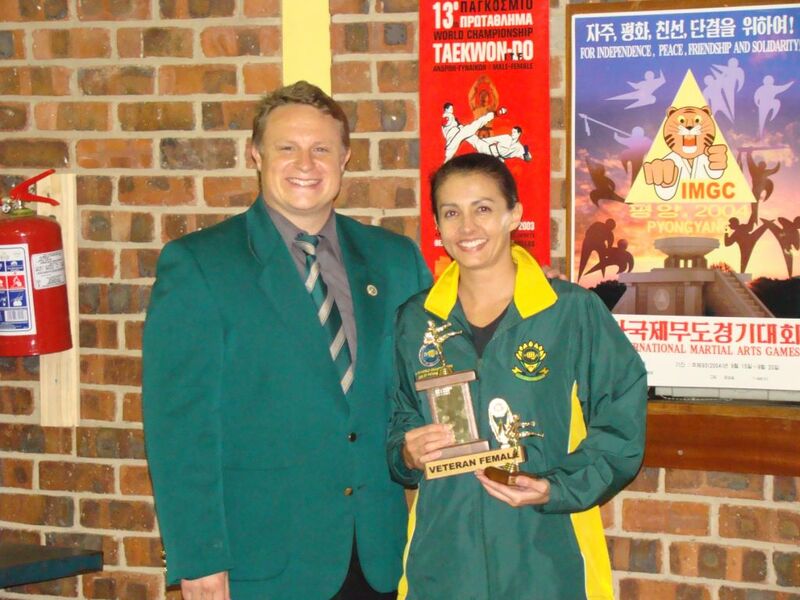 Friday the 9th of August 2013, on Women’s Day, Matthew Kent-Brown and Ulrika Liebenberg arrived just as the gates were to be opened to the venue for the 3rd Friendship Games at Primrose Wrestling Hall in Primrose, Johannesburg. We were the only two competitors from ATC on the day. Luckily there’s always a black belt and Bsb Arno Nepgen assisted us on the day with coaching. Both of us brought home two gold medals, winning each of our patterns and sparring categories. We enjoyed the day thoroughly and are looking forward to our next tournament. 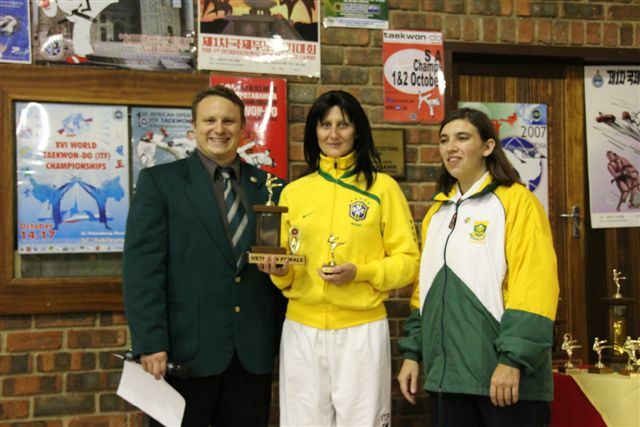 The South African team performed very well at the 2013 UITF World Championships, held 1-4 August 2013 at the Hertfordshire Sports Village in Hatfield, England. 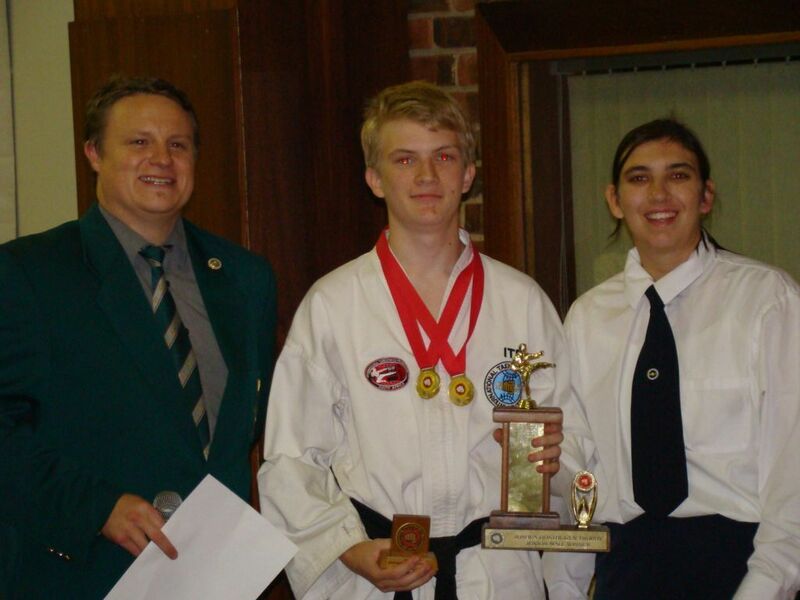 The team of 10 under coach Sbm Gerd Hummel brought back 8 medals: Gold for male 1st degree patterns (Tando Tsotsobe (Phoenix)), silver for male 2nd degree patterns (Marc Chong-Seng (Phoenix)), bronze for male 3rd degree patterns (Manie Naude (ATC)), bronze for female 2nd degree patterns (Isabel Potgieter (ATC)), bronze for male power breaking (Jason McCall (Stingers)), bronze for male special tecqhiques (Gustav Gous (ATC)), silver for male team breaking (Jason McCall (Stingers), Mike Loubser (ATC), Philip de Vos (Soo Shim Kwan), Gustav Gous (ATC), Carl Joubert (ATC)) and bronze for male team special techniques (Gustav Gous (ATC), Mike Loubser (ATC), Manie Naude (ATC), Philip de Vos (Soo Shim Kwan), Dewald Maritz (Kodang)). 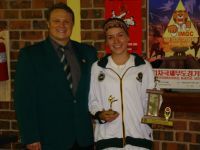 After months of dedicated training under coaches Sb Karel and Annari Wethmar, 5 of the ATC black belts, Manie Naude, Isabel Potgieter, Gustav Gous, Mike Loubser and Carl Joubert will be leaving for London, England to represent South Africa at the first Unified ITF Taekwon-Do World Championships. Even though unfortunately neither of them can accompany the team due to work and family commitments, Sb Karel and Annari nevertheless spent countless hours preparing the team physically and psycologically for the big tournament ahead. 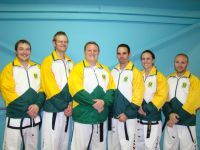 Manie, Gustav, Mike and Carl are all part of the South African male team along with fellow Dan-Gun Federation black belts Philip de Vos and Dewald Maritz. 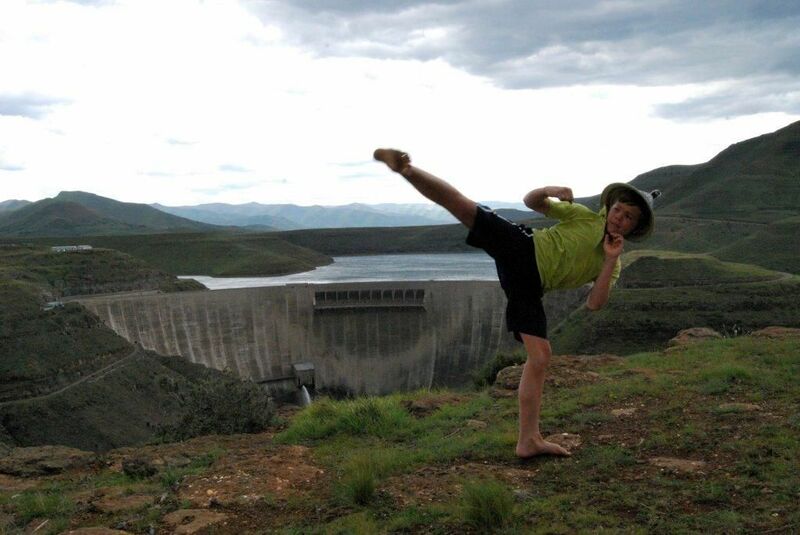 Apart from the team events, Manie will also be participating in individual 3rd degree patterns and sparring, Gustav in individual sparring and special techniques, Mike in individual 2nd degree patterns, sparring and power breaking and Carl in individual sparring. Isabel will be the official coach of the male team in the absence of Sb Karel and will also be participating in individual 2nd degree patterns and power breaking. We wish them well and best of luck with their participation in this prestigious event! On 25 May 2013 the 12th ATC Invitational Tournament kicked off at the North Gauteng Wrestle Hall in Pretoria. We arrived at the venue early on Saturday morning (23 March), nervous but excited. Students from ATC joined with other Taekwondoins from their Dan-Gun federation and from around the country in order to compete in one of the most important tournaments of the year: The Chang Hon Ryu Championship. 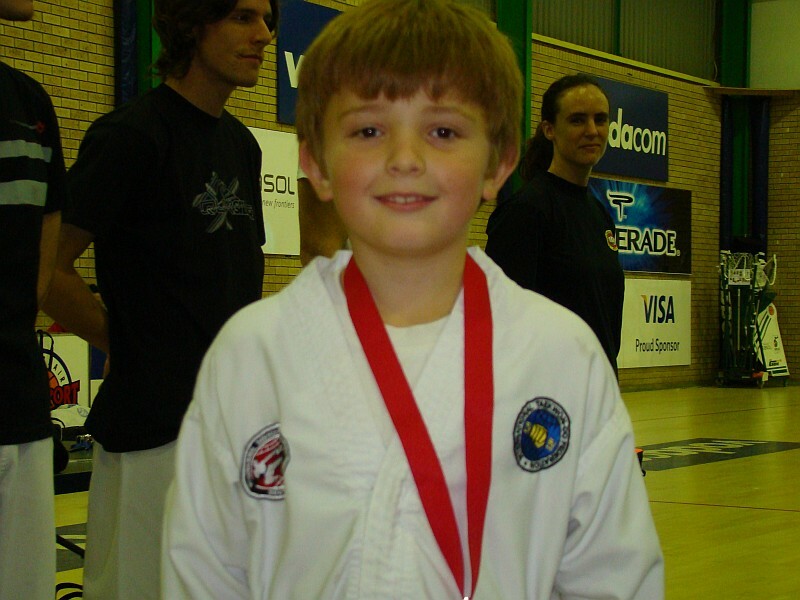 Competitors ranged in age from a mere seven years old to over fifty; from white belt to fourth Dan black belt. Everyone was keen to show off their skills in Patterns, Special Techniques, Power Breaking and of course, Sparring. In particular, this tournament held special significance for the black belts, as it was our opportunity to make a bid for a place on the national team, which will be sent to the world championships later in the year. After two days of patterns, breaking, jumping and fighting, the students of ATC had shown themselves to be the equal of anybody in the country. In addition to superb performances by the colour belts, eight ATC black belts qualified for Protea colours and will be representing South Africa internationally. Overall, the tournament was a huge success and very much enjoyed by all. Congratulations to all of the competitors from ATC. The Dan-Gun federation ended 2nd overall. You all performed exceptionally well and are to be commended. We look forward to doing it all again next year. Are you tired of punching that old bag? The 12th Annual ATC Invitational Tournament held on Saturday 25th of May in Pretoria is the perfect opportunity for you to loose all those pesky pounds. The normal entry fee is R200 per person, but if you enter before 10 May 2013 you only pay R180! If you enter now, you can spar for up to *ten rounds, maybe more! (One round guaranteed). But that's not all. If you enter now you can also participate in patterns, at no additional cost! Does that sound like a good deal yet? 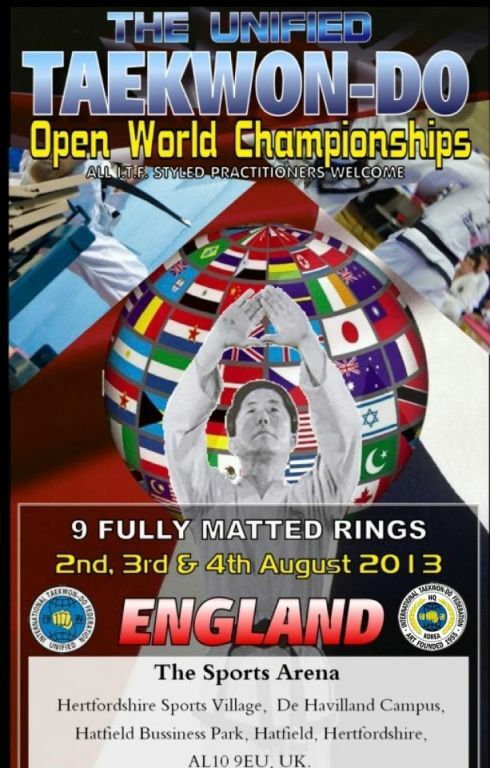 if you enter now, you also get to see some of the best martial artists in the country compete. Remember, if you enter for this great deal we will give you the oppertunity to run around a ring, punch someone in the face, do patterns, see awesome sparring, buy delicious sandwiches! See Invitation for complete details. In December 2012 ATC hosted its first holiday photo competition. ATC students could enter by submitting photos of themselves training in Taekwon-do wherever they might find themselves over the December holidays. 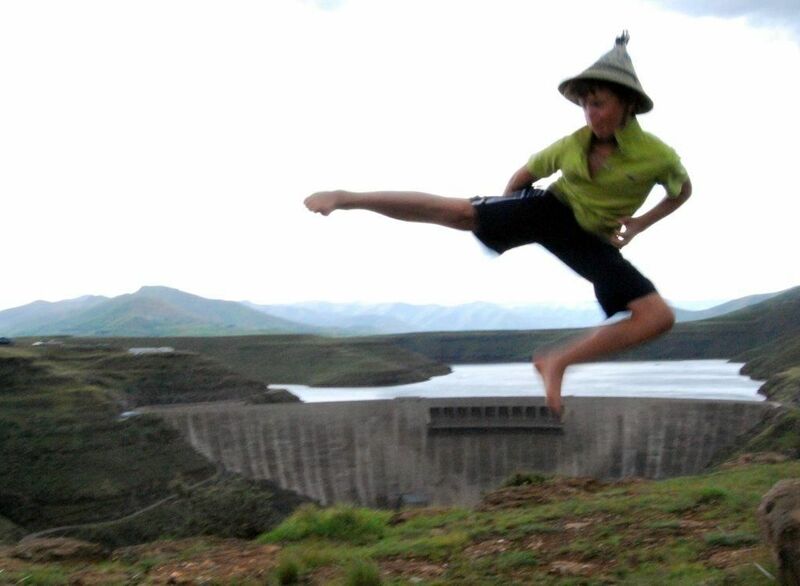 The 2012 winner was Christoff du Plessis with photos of him performing kicks at the Katse Dam in Lesotho and Hole in the wall in the Eastern Cape. This victory earned Christoff one month’s free training at ATC! 13 Students from the ATC Taekwon-Do club Elardus Park participated in the recently held SA Championships in Johannesburg over the weekend of 21-23 September 2012. 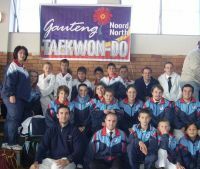 The students formed part of the Gauteng North Taekwon-Do team and did the club very proud by winning a total number of 26 medals of which 11 was gold, 9 silver and 6 bronze. 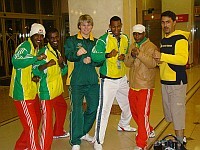 On the photo (from left to right) is Dudu Buthelezi, Nathan Shatkovsky, Gustav Gous, Christoff du Plessis, Karel Wethmar (Instructor), Bobby Rizzo, Danniëll Botes, Juané Boonzaaier. Click here for the full results of ATC Elardus Park students. 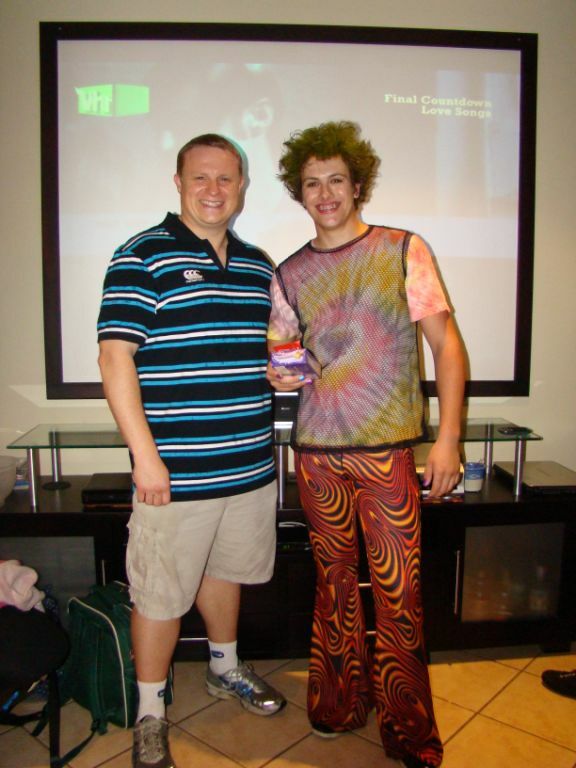 Click here for a full list of ATC students that received their Gauteng North colours for 2012. Bobby and Arnu’s World Champs results! Bobby Rizzo (left) and Arnu Nepgen (right) both from the ATC Taekwon-Do club Elardus Park, represented the South African Taekwon-Do team at the recent Veteran & Junior World Championships that took place in Tallinn, Estonia. Bobby participated in the Veteran divisions and won a silver medal for 2nd Dan patterns. He also managed to end 4th in the power breaking division. Arnu participated in the Junior divisions and managed to end in 5th position in sparring for Junior males under 63kg. We would like to take this opportunity to congratulate both of them on keeping our country and club’s name high at this prestigious event. 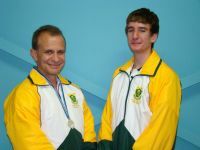 The ATC members selected as part of the 2012 SA National Taekwon-Do team that will be participating at the 10th Junior and the 5th Veteran ITF Taekwon-Do World Championships that will be held in Tallin, Estonia from 20-26 August 2012 are Bobby Rizzo, Arnu Nepgen and Karel Wethmar (Assistant coach). Bobby Rizzo will participate in the Veteran male division in 2nd degree patterns, power breaking and sparring under 73kg. Arnu Nepgen will participate in the Junior male division in sparring under 62kg, special techniques, team sparring and team special techniques. Karel Wethmar (Chief instructor) was selected as an assistant coach. All three of the representatives have received their official Protea national colours. We wish to congratulate the ATC members selected for the National team and wish them all the best of luck when participating at the World Championships. Isabel and Susan receive their black belt certificates! 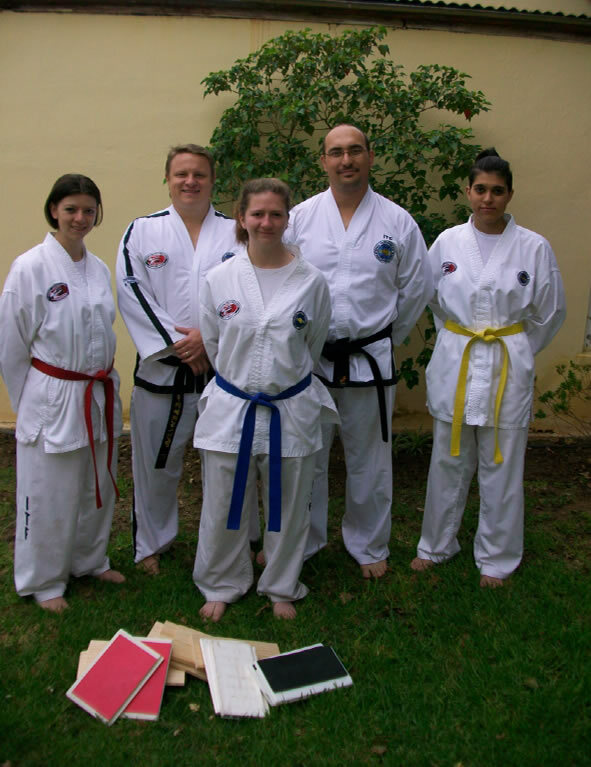 On Tuesday evening 14 August 2012, Isabel Potgieter (SA-2-113) and Susan von Wielligh (SA-1-304) received their respective 2nd and 1st Dan black belt certificates from their instructors Karel and Annari Wethmar. The black belt certificates are produced and issued by the ITF HQ office in Vienna, Austria and signed by the ITF president, Prof. Chang Ung. From your instructors and all the ATC students, a warm congratulations to Isabel and Susan for receiving their black belt certificates! 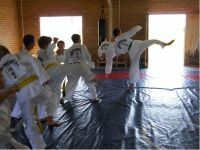 On Saturday 21 July 2012, Sabum Karel Wethmar and Sabum Annari Wethmar, chief instructors of ATC hosted a seminar and grading for the students of the Choegang Taekwon-Do Club in Lydenburg, Mpumalanga province. 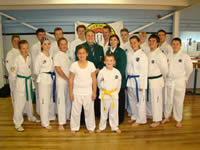 The seminar was well attended with 26 students taking part in the seminar and 14 students taking part in the grading. The seminar focused on correct application of set-sparring, hand and kicking techniques, basic principles of self defence, patterns and focusing on the grading syllabus in preparation for the grading that took place later that afternoon. A great thank you goes to Bosabum Willem Kok, instructor of the Choegang Taekwon-Do club in Lydenburg and his wife Maricke Kok for organising the seminar and venue. The instructors were very happy with the standard of training and the outcome of the grading after all 14 students passed their grading. I woke up on the morning of the grading, 26 May 2012, with the same knots in my stomach that I've always had before a grading. That feeling of: "Why oh why am I putting myself through this again?" Upon arriving at the dojang, I encountered my grading partners, Gustav Gous and Carl Joubert. One look at their faces told me that I wasn't alone in how I was feeling. We talked quietly amongst ourselves as we waited to be told what to do. It wasn't long before we found out. First, we were given an exhaustive two hour written theory test, designed to ensure that we had the knowledge required of a good instructor. Once we had finished that and the colour belts had been dismissed, we were called onto the floor to begin. At that point we realized that we had been right to be nervous about the grading. 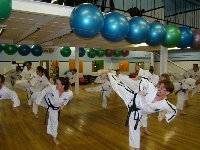 We were tested to the limits of endurance in every aspect of Taekwon-Do, from patterns and foot techniques through to some brutal self-defense and multiple opponent fighting and culminating in special techniques and power breaking. At the end of all of this, we endured a gruelling fitness exam, made all the more difficult because of the variety of injuries that we had sustained over the last two and a half hours. Finally however, at 4 'o clock in the afternoon, we heard the grading examiner say those wonderful words: "Promoted to 2nd Dan" and suddenly, it was all worth it. Saturday the 16th of June 2012 saw the North Gauteng Wrestling Hall in Menlo Park Pretoria again play host to annual ATC Invitational Tournament. It was the eleventh time that ATC hosted this event which has become a highlight on SAITF calendar, and this year’s instalment was the biggest yet. 250 students competed on the 4 rings crammed into the hall and the organizers also found space for them to do power breaking and special techniques! The competition was tough and the schedule was tight but thanks to the skilful planning of SabumAnnariWethmar it all ran smoothly. Finally at around six o clock in the evening the tired competitors and officials, who had stuck around until the end, sat down for the prize giving ceremony. Throughout the entire day it had been a close race between ATC and the students from Pil Sung, but in the end it was the hosts who were victorious for the second year in a row. The final score saw ATC with 245 points, narrowly beating to PilSung’s 236. 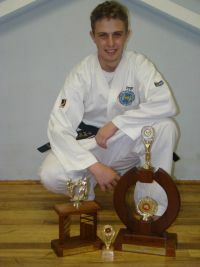 GTF Taekwond-do was third with 177 points. On behalf of the competitors and parents I’d like to thank Sabum Karel and Sabum Annari for all the hard work they put in and congratulate them on hosting another fine tournament. 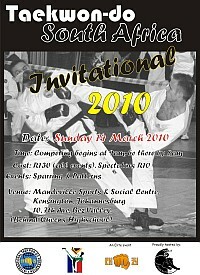 It's with great pleasure that we invite you to the 11th Annual ATC Invitational Tournament to be held on Saturday 16 June 2012 in Pretoria. It was that time of the year again for all to be recognised for their hard and dedicated commitment during the year. With many dressed to rock the evening it started off with a rainy night. 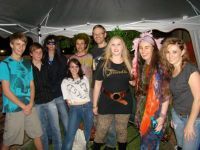 But no rain could dampen the spirit of rock legends and class wining students receiving their trophies and certificates. The function then moved over to a braai for the hungrier student and once again no rain could stand in the way of a hungry student. Best dressed rock legend was chosen and awarded for the effort made by all students to make the theme a memorable evening. The party rocked on and was enjoyed by all till late. A year to remember! Carl and Michael receive their black belt certificates! 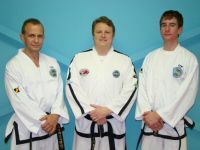 On Tuesday evening 22 November 2011, Carl Joubert (SA-1-300) and Michael Loubser (SA-1-301) received their 1st Dan black belt certificates from their instructors Karel and Annari Wethmar. The black belt certificates are produced and issued by the ITF HQ office in Vienna, Austria and signed by the ITF president, Prof. Chang Ung. 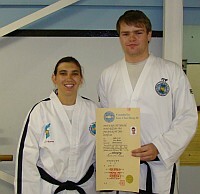 They both graded to 1st Dan on 27 November 2010. From your instructors and all the ATC students, a warm congratulations to Carl and Michael for receiving their 1st Dan black belt certificates! 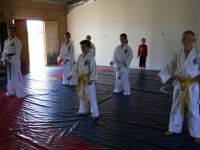 On Tuesday morning 22 November 2011 the ATC Kids Taekwon-Do class in Garsfontein, Pretoria had its last class for 2011 as well as customary year-end party. After the kids aged 3-5 performed their tests they received certificates from their instructors Annari & Karel Wethmar. 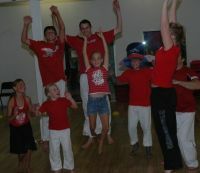 The kids enjoyed the class thoroughly and are looking forward to the classes starting again in January 2012! On behalf of the club we would like to congratulate Hendré, Keagan, Sumari, Nerine, Reon, Marno, Juné and Anel for passing their test with flying colours. On the morning of 1st of October 2011 a number of Taekwon-Do schools representing their different federations lined up in front of the Portuguese hall, in Turffontein, eagerly anticipating the start of the 1st Veritas Taekwon-Do championship. At the start of the pre-chosen song that each federation had selected all the students from that federation professionally marched into the hall, lining up in front of the stage where all the senior officials were waiting. At the command from the most senior member of the federation all the students snapped to attention and bowed. As they were commanded back into a parallel stance the next federation’s song started playing and so on, until finally all the students where neatly lined up, ready for the tournament to begin. With a couple of aspiring and encouraging words from the tournament director, the first categories where announced to start and the tournament took off. With every ones spirits high we started with patterns in the three well organized rings, tigers in the one and juniors in the other two. Because of the vast amount of tiger students they kept the judges busy at the first ring for the rest of that day and the morning of the next day. The juniors went by quite fast, making space for the senior and veteran colour belts to do their part for their federations by collecting as many gold, silver and bronze medals as possible. After the lunch break it was time for the black belts to show their techniques and do there jaw dropping patterns. Thanks to the judges, willing to do their part, the black belts finished their patterns to roaring applause from the audience. Finally it was time for the sparring to start. The juniors colour belts opened the sparring rings. Everywhere students were busy warming up with their coaches, going through their well-practiced combinations to score as many points against their opponents as possible. With every category finishing there was always a great applause from the spectators and handshakes all around when the medals were awarded for the winner of those well fought matches. At 19h00 on Sunday morning the championship took off at full swing. The tigers going on with their patterns and the black belts starting with their sparring matches. The excitement of the black belt sparring is always something to look forward to. With their advanced techniques and blistering speed, they always keep the spectators transfixed. When the black belts had finished with their sparring the rest of us could start with special techniques and power breaking. 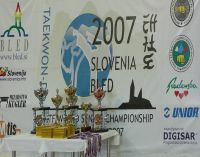 The junior’s started with the special techniques and by showing their skills they finished before the lunch break, raking in medals and those very valuable points for their federations. After the lunch break the very popular power breaking event started. People gathered around the power breaking horse and the competitors as they showed everyone their strength and skill as they broke the tough breaker boards with the pre-set hand and foot techniques. After a very exhausting weekend the tournament finally came to an end on Sunday night. Each federation lined up and the federation with the most points was announced as the 1st Veritas Championship winner. Thanks to the hard work and dedication of the people who organized the tournament it went very well and was enjoyed by everyone. 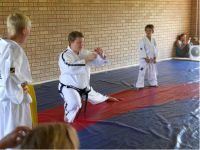 On Saturday 13 August 2011, Sabum Karel Wethmar, chief instructor and Bosabum Manie Naude, assistant instructor of ATC hosted a seminar for the students of the Kodang Taekwon-Do club and Potchefstroom Taekwon-Do club in Vanderbijlpark, Southern Gauteng province. The seminar primarily focused on preparation for the upcoming federation grading in Pretoria and therefore most of the time was spent focussing on the grading syllabus. A great thank you goes to Bosabum Stefan van der Linde, instructor of the Kodang Taekwon-Do club in Vanderbijlpark for organising the seminar and venue. The instructors were very happy with the standard of training and said they were looking forward to the upcoming federation grading to see everyone in action. Good luck to all the grading candidates! 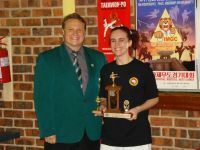 The 2011 SA-ITF Inter Provincial Tournament or better known as the Closed SA Championships took place on Saturday 18 June 2011, at the Primrose Wrestling Hall, Johannesburg. With only the top competitors from each province representing their respective province, the national tournament promised to be a show down of the best of the best. Northern Gauteng, Limpopo, Mpumalanga, Southern Guateng, Central Gauteng and Kwazulu Natal sent teams to participate. A total of 27 ATC students were represented on 2 provincial teams at this year’s national championships. 18 students from the ATC Elardus Park dojang in Pretoria represented the Northern Gauteng province and 9 students from the ATC Thabazimbi dojang represented the Limpopo provincial team. The ATC members on both these provincial teams received their official Northern Gauteng and Limpopo provincial colours through affiliated provincial structures. The 27 ATC students won a total of 44 medals with 19 Gold, 15 Silver and 10 Bronze medals making up the spread. The instructors of the 2 dojangs, Sbm Annari Wethmar, Sbm Karel Wethmar and Bsb Thereasa Tolmay said that they were very happy with their students’ performance at the 2011 national tournament and that their students did them proud. Please click on the below link to see a detailed break down of all ATC students’ results achieved at the 2011 SA-ITF Closed Championships. Thank you for all your hard work and sacrifice. Thank you for your leadership you have provided to our club over thelast year and for pushing us to strive for excellence every day. Thank you for setting an example we strive to follow. We hope that the year ahead brings joy and blessings to you and your family. 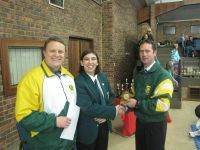 It was a gloomy morning of grey skies and cool weather that met the students from all over Southern Africa for the 10th Annual ATC Invitational Tournament on the 7th of May 2011 that took place at the Gauteng North Wrestling hall in Menlo Park, Pretoria. All though the hint of cold and clear anticipation of what was to be an eventful day had students nervous, we were fortunately met with warm welcomes from both the organisers and the general comrade among students who have participated together for years. And so with warmth in everyone’s hearts and great excitement Sabum Karel Wethmar started proceedings with a warm welcoming to everyone. Before proceedings got underway Sabum Annari Wethmar had the tournament schedule and programme on the wall, and in the fashion of her great organisational skills it was followed closely to the end of the day. A special thanks to all the black belts, instructors and students who assisted the organisers with judging and refereeing. For those whom did not notice, each floor requires seven officials for the competition to commence and for the majority of the day the three floors and power breaking/special technique area were manned. At the same time many of these officials still had to participate and rotation was done effectively! We were also honoured with the presence of Bosabum Chris Van der Merwe founder of ATC and the Annual ATC invitational Tournament, a special thanks to you for the wonderful pictures you took, and for starting something that have endured for a decade and many more to come! We also would like to extend a special thanks to Millennium Minolta for sponsoring the beautiful 10th anniversary medals. Also thanks for your sponsorship of the medals over the past number of years. Further more the day progressed with relative ease and efficient speed. From tigers to veterans patterns and sparring were conducted gracefully. With a clear view of great talents on the rise from all over, we are assured of better and more and more competitive tournaments to come! 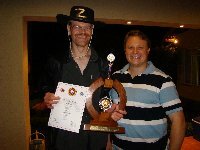 It is however on this day, the 7th of May 2011 that ATC took back the tournament trophy as the over all winner for the first time in three years! We should all be proud of this achievement! Under guidance of our exceptional instructors and with hard work we can now strive to keep it where it belongs! A special thanks to everyone who participated! Everyone who judged, refereed and assisted. To the ladies and gentlemen that assisted in the tuck shop. And most special thanks to Sabum Karel and Annari for organising and running this tournament. And the awesome guidance they give to us all! 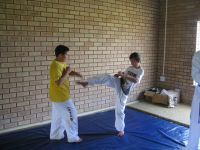 As most of you are aware, Bsbnim Chris van der Merwe (founder of ATC) opened two dojang (one for Juniors and one for Seniors) in Cullinan, east of Pretoria, when he moved there from Randburg at the end of 2005, but had to close the school again in September 2008 when he got a job-offer in the USA. The economic down-swing hit the USA just about then and Bsbnim Chris was back in South Africa on 31 January 2009. Since his return from the USA he has had numerous requests from his “old” students and their parents to re-open the Cullinan schools. 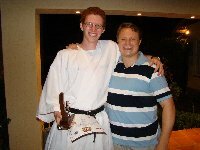 Bsbnim Chris was very reluctant at first because until March 2010 had been working for a US company and spent prolonged periods abroad, making sustained teaching impossible. Since joining Standard Bank Africa head office in April 2010, the situation has normalised slightly, making it more feasible to re-open ATC in Cullinan. On Tuesday, 10 May 2011, Bsbnim Chris received a phone call from Captain Coralie Nel of the Cullinan SAPS imploring him to please reconsider. It was the final straw and the decision was made. A venue had to be sourced and contracted, the word had to be spread, the latest syllabus and supporting documents had to be sourced, SA-ITF executives had to be informed, lesson plans had to be drawn up (at least for the first month), dobok and gear suppliers had to be found, etc. etc. 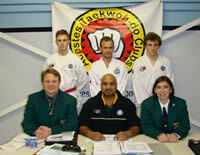 The first three classes kicked off in the Centenary Sport Centre, Main Street, Cullinan, on Tuesday evening, 17 May. 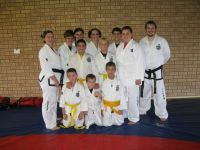 For the time being Bsbnim Chris teaches both the Tigers (6yr to 13yr) and Seniors (14yr and older) dojang while Kyosa Lannea Botha teaches the Cubs (pre-White belts, 3yr to 5yr old). On the first night the Cubs had 1 student, Cullinan Tigers had 13 students and Cullinan Seniors had 6 students. By the third class the Cubs stood at 3, Tigers at 19 and Seniors at 9. We wish ATC Cullinan all the best for the future. Go ATC! 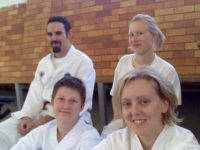 On Saturday 16 April 2011, the 3 of us, Isabel Potgieter, Danniell Botes and I, Mike Loubser arrived in Thabazimbi at the ATC Platinum Dojang (Setaria) after a drive through pouring rain and a picnic on the side of the road to find a highly enthusiastic young bunch of Taekwon-Doins waiting for us. I know they were enthusiastic because they had all arrived an hour and a half before us and were raring to go! We started off with hand and foot techniques and moved on to sparring and special techniques. This was interspersed with numerous rounds of padwork, which was no doubt thoroughly enjoyed by the parents who had stuck around to watch and support. We trained from 10:30 until around 16:30 (with a break for lunch) and the students worked really hard throughout that time. After training with ATC Platinum for that Saturday, I can honestly say that the cold, miserable weather was more than compensated for by the warm, kind people who looked after us during our time there. We all thoroughly enjoyed ourselves and look forward to seeing them again soon. 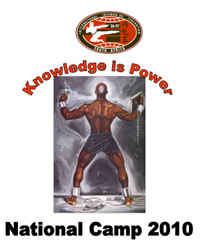 It is the 10 year anniversary of the annual ATC Tournament and warriors all over the world are preparing to join in the celebrations by competing in this joyous event. The brave warriors will be challenged in not only sparring and patterns but power breaking and special techniques as well! Are you brave enough to rise to this challenge? 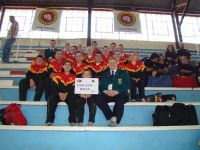 On Saturday 2 April 2011, 7 ATC students participated at the SA-ITF Autumn Tournament held at the Primrose Wrestling Hall, Johannesburg. The ATC team was accompanied by one of their instructors Karel Wethmar and parents and friends that supported the students on the day. 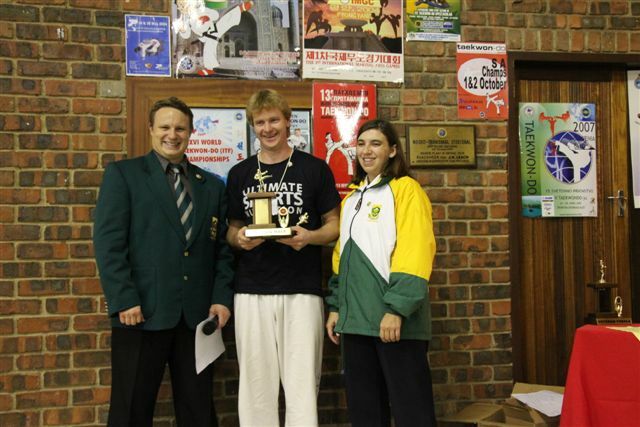 Gustav Gous (1st Degree black belt), apart from participating also assisted as an umpire at the tournament through out the day. We wish to congratulate the students with their great results and achievements. In addition we would also like to thank all the parents and friends that supported the ATC students on the day. 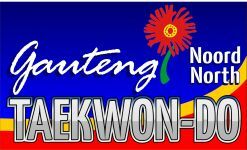 On Saturday the 26th of March the 2nd Gauteng North ITF Taekwon-Do Championships took place at the Menlo Park Wrestling hall. Thanks to the brilliant organisation of Sabum Annari Wethmar the competition ran smoothly and ended in good time. ATC Elardus Park who was represented by the majority of its students once again proved to be the dominant club in the Gauteng North region. Taking 64 of the 102 medals on offer for the day. We were followed by ATC Platinum (Thabazimbi) with 16 medals, Hwa Rang (Lydenburg) with 11, Tong-Il (Pretoria) with 9 and Juche (Pretoria) with 2. 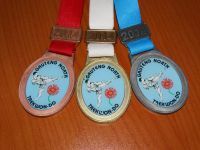 Amongst the many medals proudly won by ATC, 24 members received their Gauteng North Taekwon-Do Provincial Colours and will represent ATC and the Gauteng North Province at the National Champs in Johannesburg from 16-18 June 2011. Please view the names of the ATC members who received their colours here. Congratulations to everyone! 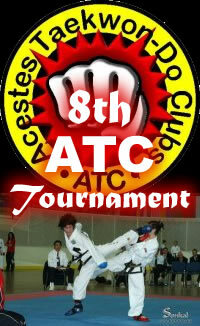 It was a truly successful tournament for ATC. And thank you for everyone who came early and stayed behind to assist in the preparations and clean up! And a special thanks to Sabum Karel and Sabum Annari for their excellent organisation and training helping all of us to achieve! 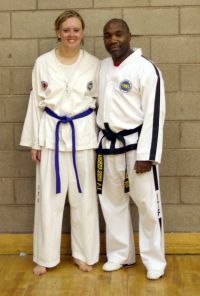 On Saturday, 12 February 2011, the ATC Platinum Taekwon-Do club were fortunate to have Sabum’s Karel and Annari Wethmar to present our first seminar. We were busy for 3 hours concentrating on all Taekwon-Do aspects: foot and hand techniques, patterns, set-sparring, free sparring and self defense. The students enjoyed the seminar to bits and learned so much. We at the ATC Platinum Taekwon-Do club would like to give our thanks to the 2 Sabum’s for such great and useful information. 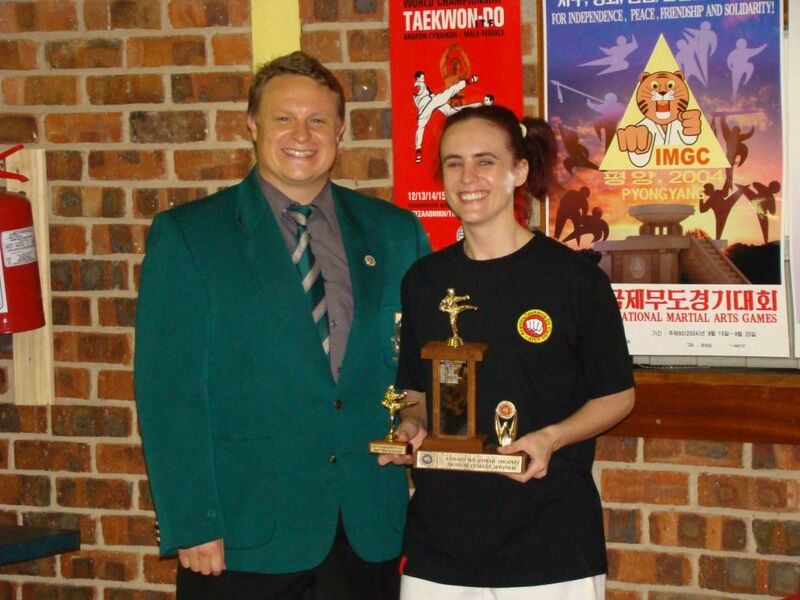 On Saturday the 12th of February the first Tong il innovation tournament took place at the Tong il dojang in Groenkloof, Pretoria. It was a beautiful sunny morning, a delightful change to the recent gloomy days in Pretoria. With a lot of enthusiasm and certainly some tension the young tigers and juniors started to arrive at the honourable Senior Master Kim Jong Su’s dojang. Young students from all over Gauteng and ATC’s very own young Sarel Swanepoel and Tristan Blokker completed their registrations and the tournament swiftly got under way. Our two young ATC representatives accompanied by their parents and Bsb Manie Naude, Bsb Isabel Potgieter, Bsb Carl Joubert as well as Pieter van Heerden and Willie Smith showed an excellent comfort and focus. Sarel won his first match with ease and grace, a rather soothing sight from such a young and still very inexperienced student, with his second not being as successful against a far more experienced student. Tristan proved to be every bit as competent as we expected from such a talented young man. Although he lost his first match and drew his second, he certainly proved that he will be a future medal winner. I am happy to report that the future looks rather bright for our youngsters from ATC, and we can be certain that ATC will continue its exceptional performances on both the national and international levels. We can all be proud and exceedingly happy to be students of Sbm Karel and Sbm Annari Wethmar whose continuous guidance and warm support has proven to be remarkable from tiger to veteran level. I believe this year will be a great one for ATC and look forward to seeing everyone in class!! ATC has expanded it’s borders and under the leadership of Sabum Annari Wethmar started Taekwon-Do Kids. 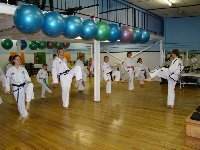 This is a training initiative for 3 to 5 year olds and focuses on training beginner Taekwon-Do techniques with the young ones. 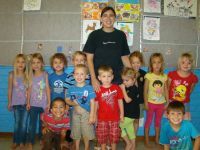 She started the initiative at one of the local nursery schools, Snippersnip, in Garsfontein, Pretoria East. A number of demonstration classes were given to test the children’s response to training Taekwon-Do and although starting very small the group training actively has grown to 8 students over the past month. Congratulations Sabum Annari with the success of your new initiative! On Thursday 3 February 2011 Mr. Sanko Lewis (4th Degree black belt) from Seoul, South Korea visited the ATC Elardus Park dojang for some interesting training. 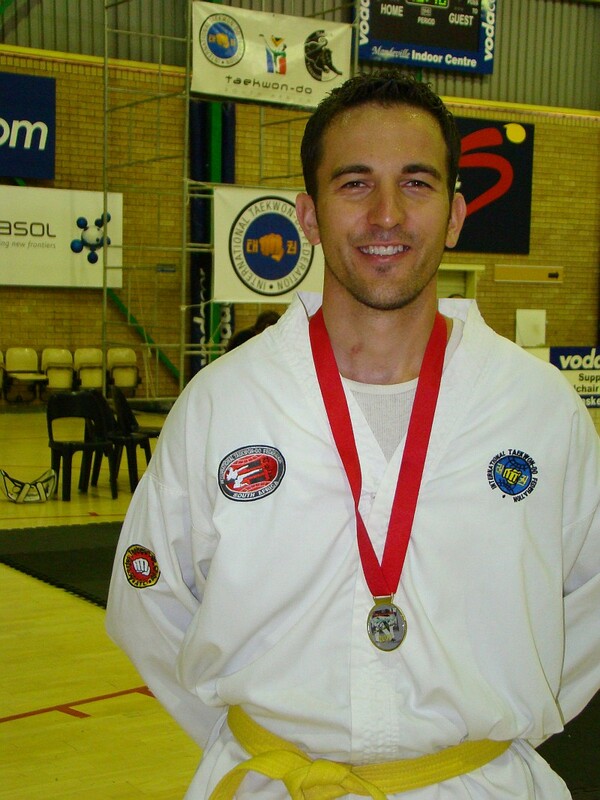 He is also the Federation head of the Soo Shim Kwan (Potchefstroom region) and a black belt holder in both Taekwon-Do (4th Degree) and Hapkido (1st Degree). He also trains in Ju-Jitsu and Taek-Kyon while he resides in Seoul. Mr. Lewis’ work contract with the Sahmyook University in Seoul has been extended for another 12 months. He works in the department of English studies at the University and teaches English Literature. Currently he is on holiday in South Africa to visit friends and family before departing for Korea on 26 February. 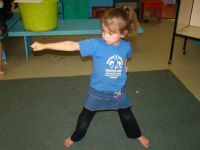 The class was used to share interesting ways of doing fitness and strength exercises. Then came the fun part where the class was introduced to Taek-Kyon training. The students learned the basic movements, kicks and hand techniques as Mr. Lewis shared his wealth of knowledge of the ancient Korean Art. He also shared his views and knowledge on where certain ITF techniques originated between the cross pollination of Karate (of which Genl. Choi was a black belt holder) and Taek-Kyon. The students enjoyed the class immensely and are looking forward to Mr. Lewis’ next visit to the ATC Dojang. 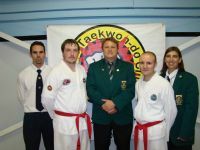 We at the Robertson Dojang in the Western Cape province of South Africa, were fortunate to have Sabum Karel Wethmar give our first ITF seminar for 2011 in our small and humble town! 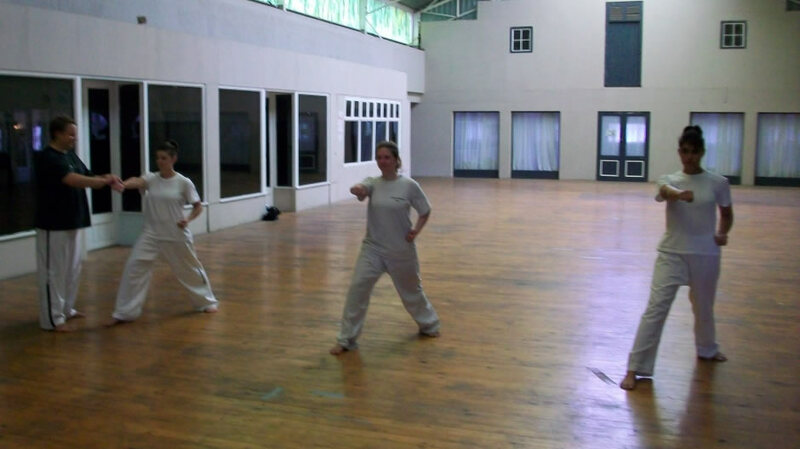 Bright and early on the 22nd of January after many hours of travel we started our seminar at the Robertson dojang. To kick-start the seminar Sabum Karel went through all the hand techniques for all the belt groups that were represented at the seminar. Afterwards we worked on kicks followed by my favourite... Patterns. Changing and adjusting as we went along to correct body posture and hand positions time seemed to have no speed limit as it flew by and before we knew it lunch was upon us! After a much appreciated snack we continued working through the syllabus covering special techniques, breaking, set-sparring, free sparring and self defence. We were getting so excited we almost didn’t realise that we were already past the time. Ahhhh then came the grading...... As we all know this is the part where we think: “Do I really know everything? Am I going to be able to break? Will I pass this grading....?” I am going to say this not just as the instructor of the ATC Robertson dojang, but also as a friend..... THE STUDENTS WERE AWESOME!!! They knew their theory, surprised me with breaks on the special techniques, hand and foot techniques came naturally..... I couldn’t be more proud! As darkness set in around us the grading came to a close. The results were read and the relief was instant, gratitude flowed through the hall like a light breeze at the end of a hot summer’s day.... everyone passed! The next morning after a good night’s rest we all came together for a photo session and to fare Sabum Karel well as he was on his way again. Now we are excited to begin learning the new syllabus for the next grading and getting to work for our next seminar, hoping it will come soon as we all learned and enjoyed it a lot! It’s my second trip down to Antarctica, where I have been working as a field scientist doing research on climate change and landform evolution. 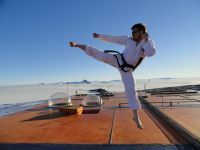 We left Cape Town harbour on 8 December 2010 and sailed south for the Great White Desert. We will be away from home for almost three months, returning back to Cape Town on 18 February, 2011. After a three week voyage on the SA Agulhas, we arrived at South Africa’s Antarctic base, SANAE IV. SANAE IV is one of the most advanced bases in Antarctica, making use of a revolutionary design that is now being adopted by other countries that operate here. It is truly something magnificent and something of which all South Africans can be well proud. As a geomorphologist, I and my two team-mates will be travelling into the frozen wastes by snowmobile and helicopter, far away from the comfort and security provided by SANAE. There we will check and replace equipment that has been planted at various locations and transmit the data that has been gathered back home. In addition, we will explore the beautiful snowy mountains that stick up above the ice here, trying to understand why they formed in the way that they did. Antarctica is without a doubt the most beautiful place in the world. It is desolate and hostile, but wild and beautiful. It has been the great privilege of my life to come here and see the things that I have seen and to live in a place that is almost completely untouched and untamed by man. It is nature wild and chaotic. It is a place for your soul to be free. 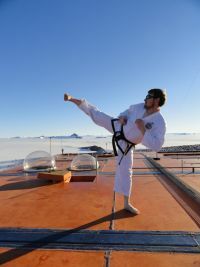 As you can see on my photos, I found some time in between work and recovering from the icy cold to train Taekwon-Do. 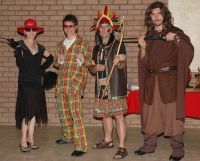 The 2010 ATC year-end function and prize giving took place on Friday 26 November 2010 in Waterkloof, Pretoria. 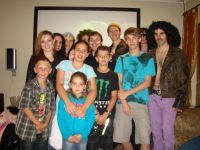 This event, which took on the theme of dressing up like your “Favourite superhero or villain” coincided with a social braai (barbeque) for dinner. From Peter-Pan to Cat Woman, from Zoro to Captain Hook, from Two Face to Samurai Jack, from Clark Kent (alias Superman) to Power Puff Girls and from a Jail bird to Batman to mention just but a few, were all in attendance. Before formalities started the best dressed members were voted for by the ever involved audience. After a blink back over the 2010 Taekwon-Do year by chief instructors Annari and Karel Wethmar, capturing all the highlights of the events participated in by the club over the past year, the prize giving started. 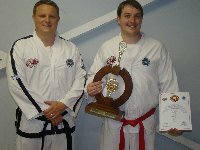 The “ATC Black belt of the year” award went to Gustav Gous. The “Most promising student” award went to Nathan Shatkovsky and the “Most improved student” award went to Tawie Wolvaardt. “Tiger of the year” award went to Juane Boonzaaier, “Junior of the year” award went to Matthew Shatkovsky, “Senior of the year” award went to Susan von Wielligh and the “Veteran of the year” award went to Bobby Rizzo. The main award of the evening was the “ATC achiever of the year” award and for the 2010 year it went to Matthew Shatkovsky. For a complete list of all the winners of the 2010 awards and floating trophies please visit the “Roll of honour”. It’ with great honour that we announce that 2 of ATC’s students received the annual Presidential Student of the year Award, in their respective categories. 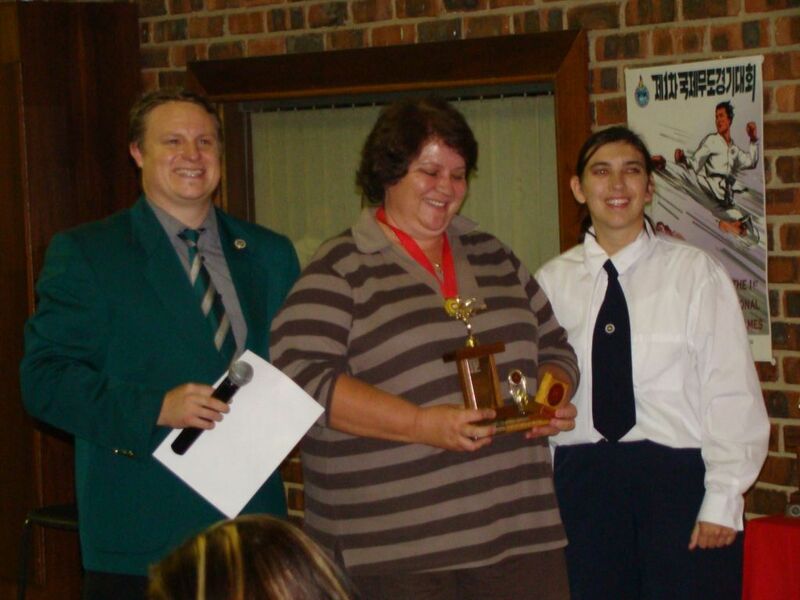 Susan von Wielligh received the Presidential award for Senior Female of the SA-ITF for the year 2010. 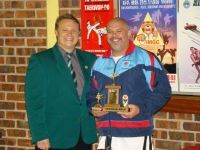 Bobby Rizzo received the Presidential award for Veteran Male of the SA-ITF for the year 2010. As the chief instructors of ATC we would like to congratulate both Bobby and Susan on this great achievement. 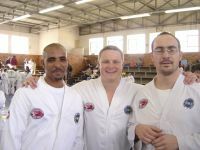 The 2nd black belt and 4th colour belt grading of the Dan-Gun Federation for 2010, took place on Saturday 27 November 2010 at the Elardus Park Dojang, Pretoria. The day got under way at 7h00 with the colour belt grading conducted by Federation co-heads Karel & Annari Wethmar. 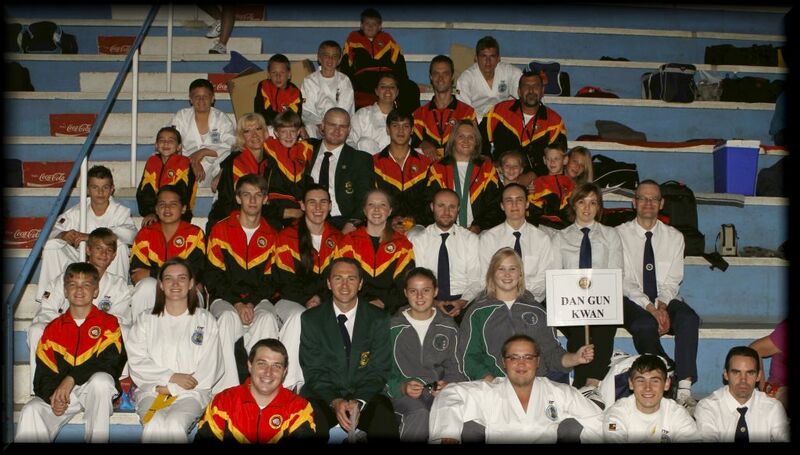 Students from the Dan-Gun Federation (Pretoria and Vanderbijlpark dojangs) participated in this grading. The grading examiners expressed their satisfaction with the standard of the grading and 25 students passed their test. Congratulations to all the students with their great achievement! The black belt grading followed directly after the colour belt grading and was conducted by Karel Wethmar (Newly IIC qualified instructor) and assisted by Annari Wethmar (4th Degree black belt, Member of Technical Committee SA-ITF – Northern Gauteng Region) and Manie Naude (3rd Degree black belt). 2 Students from the Dan-Gun Federation participated in the grading and we are very proud to announce that both of them were successful with their attempt. Carl Joubert and Michael Loubser graded to 1st Degree black belt. Congratulations to Carl and Michael, your hard work paid off! 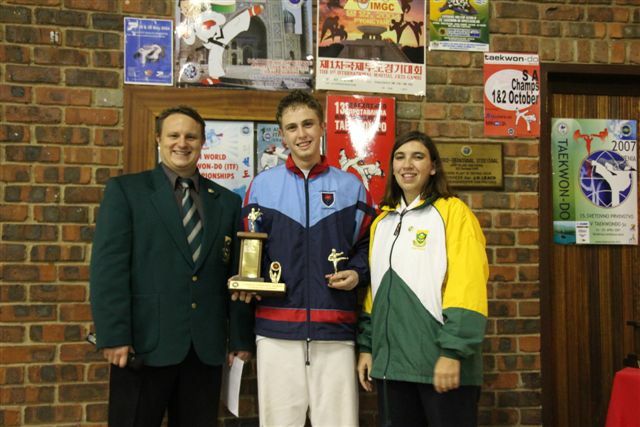 The South Africa (SA) National Championships took place over the weekend from 24 to 25 September 2010 in Turfontein, Johannesburg, Gauteng. Just over 300 competitors from clubs and provinces all over South Africa entered and participated in this prestigious annual tournament. This was the best attended National Championships to date. ATC entered 25 participants into the tournament and won a total of 25 medals that consisted of 9 Gold, 10 Silver and 6 Bronze medals. Overall ATC managed to end in 4th position. Bobby Rizzo (1st Degree), Matthew Shatkovsky (1st Degree), Riccardo Rizzo (1st Degree) and Karel Wethmar kept ATC’s name high at the past 9th Junior and 4th Veteran World Championship, held in Minsk, Belarus from 21 – 28 August 2010. 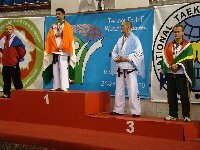 Bobby won 2 bronze medals at this prestigious event, each for sparring for males under 73kg and for 1st degree black belt patterns. 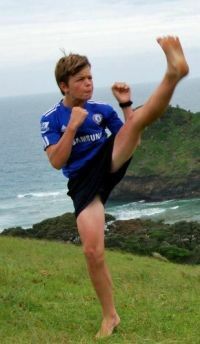 Matthew kept the club’s name high when he won his team sparring match against his opponent from Turkmenistan. The self-defence routine for veteran males where Bobby was the defender and Karel, Riccardo and Matthew the attackers ended in 5th position. The members enjoyed their trip to Minsk, Belarus immensely and also included photos of some of the sights they visited under the Galleries while at the World Championships. We congratulate all of you with your great results and achievements! 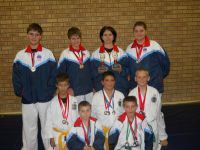 The ATC members selected as part of the 2010 SA National Taekwon-Do team that will be participating at the 9th Junior and the 4th Veteran ITF Taekwon-Do World Championships that will be held in Minsk, Belarus from 21-28 August 2010 are Bobby Rizzo, Matthew Shatkovsky, Riccardo Rizzo and Karel Wethmar (Assistant coach). Bobby Rizzo will participate in the Veteran male division in 1st degree patterns, power breaking, sparring under 73kg and self defence routine. Matthew Shatkovsky will participate in the Junior male division in 1st degree patterns, sparring under 69kg, team events and as an attacker in the veteran male self defence routine. Riccardo Rizzo will participate as an attacker in the veteran male self defence routine. 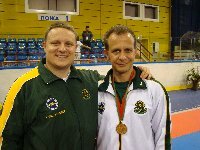 Karel Wethmar (Chief instructor) was selected as an assistant coach and also an attacker in the veteran male self defence routine. The 3rd ATC Spur evening took place on Thursday 17 June 2010 at the Spur Atterbury Value Mart. The evening proofed to be a huge success due to the great turnout of club members, friends and family. 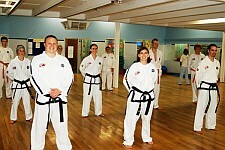 A number of ATC students and black belts assisted as runners under the leadership of Bobby Rizzo. The prize that was raffled of during the evening was a 4-in-1 laser printer, scanner, copier and fax worth more than R2 500. We would like to thank Millennium Minolta for sponsoring this great prize. The 4-in-1 was won by Christo Fourie and his wife Monette accepted his winnings on his behalf on Thursday 24 June 2010 during class time. We would also like to thank Atterbury Value Mart Spur and all the ATC students, friends and family that supported this great evening. 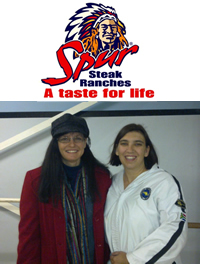 We look forward to the next ATC Spur evening scheduled for Thursday 15 July 2010 at the Atterbury Value Mart Spur. 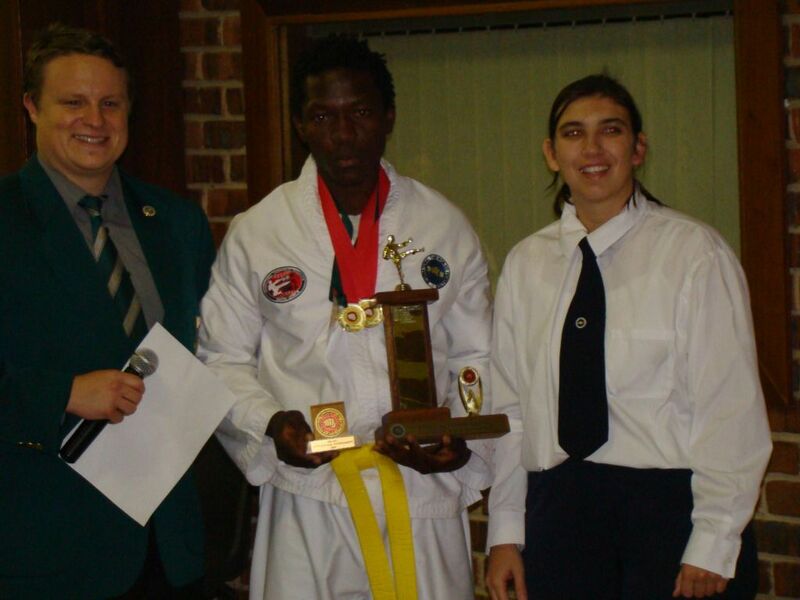 The 1st black belt and 2nd colour belt grading of the Dan-Gun Federation for 2010, took place on Saturday 5 June 2010 at the Elardus Park Dojang, Pretoria. The day got under way at 8h00 with the colour belt grading conducted by Federation co-heads Karel & Annari Wethmar. 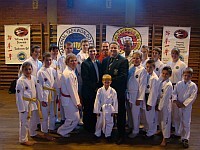 Students from the Dan-Gun Federation (Pretoria) and Shim Duk Federation (Vanderbijlpark) participated in this grading. The grading examiners expressed their satisfaction with the standard of the grading and 15 students passed their examinations. Congratulations to all the students with their great achievement and continue to train hard. The black belt grading followed directly after the colour belt grading and was conducted by Shaheed Karachi (5th Degree black belt and Technical director of the SA-ITF) and assisted by Karel & Annari Wethmar (4th Degree black belts, Member of Technical Committee SA-ITF – Northern Gauteng Region). 3 Students from the Dan-Gun Federation participated in the grading and we are very proud to announce that all 3 of them were successful with their attempt. 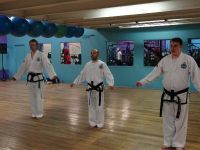 Bobby Rizzo graded to 2nd Degree black belt and both Riccardo Rizzo and Matthew Shatkovsky graded to 1st Degree black belt. Congratulations Bobby, Riccardo and Matthew, your hard work paid off! 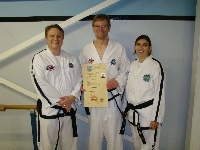 Black belt certificate for Gustav! 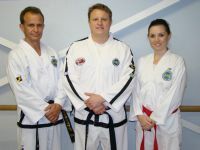 On Tuesday evening of 18 May 2010, Gustav Gous received his 1st degree black belt certificate from his instructors, Annari and Karel Wethmar. 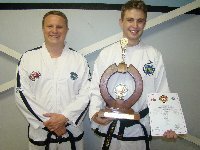 His black belt certificate number is SA-1-263. The black belt certificates are produced and issued by the ITF HQ office in Vienna, Austria and signed by our president, Prof. Chang Ung. Gustav, congratulations from your instructors and all the ATC students! The 2nd ATC Spur evening was hosted on Thursday evening 13 May 2010 at the Spur in the Atterbury Value Mart in Faerie Glen, Pretoria. The evening was a huge success due to the great turnout of all the club members, friends and family. The ATC students that assisted the waiters of the Spur as runners did a splendid job under the leadership of Bobby Rizzo. The hamper containing goods worth more then R3 500 was won by Theresa van der Merwe. There were also 2 smaller prizes that could be won. Celeste Richardson won the 2nd prize and Arina Vrey collected the 3rd prize. We would like to thank our sponsors of the hamper and prizes: Nutrition Lab, Africa Photographic, I Style Studio, De Haven Oost, Fred Botha, Magda Schmelzenbach, Nimue SA and Spur Atterbury Value Mart. The ATC chief instructors would like to thank Anette Botha and Juanita Boonzaaier for organizing and arranging the contents of the hamper as well as the 2nd and 3rd prizes that were raffled off during the evening. We would also like to thank Atterbury Value Mart Spur and all the ATC students, friends and family that supported this evening. We look forward to the next ATC Spur evening scheduled for Thursday evening 17 June 2010 at the Atterbury Value Mart Spur. 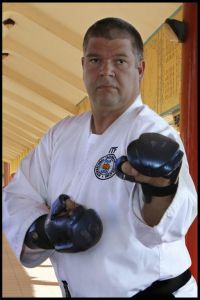 On Saturday 13 March 2010, Stephan Maritz, 3rd Degree black belt and instructor of the ATC Robertson Dojang in the Western Cape got married to Nicolene. 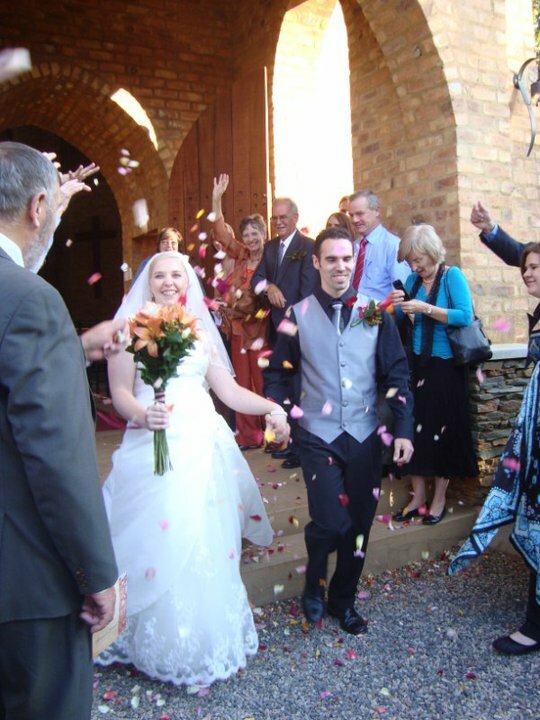 The wedding took place on the Van Loveren Wine Farm close to Robertson. 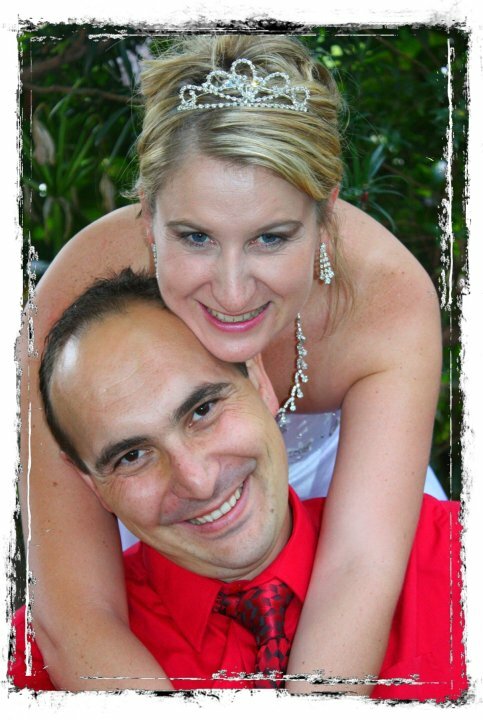 On Saturday 17 April 2010, Manie Naude, 2nd Degree black belt and assistant instructor of the Elardus Park Dojang got married to Janet Loubser. 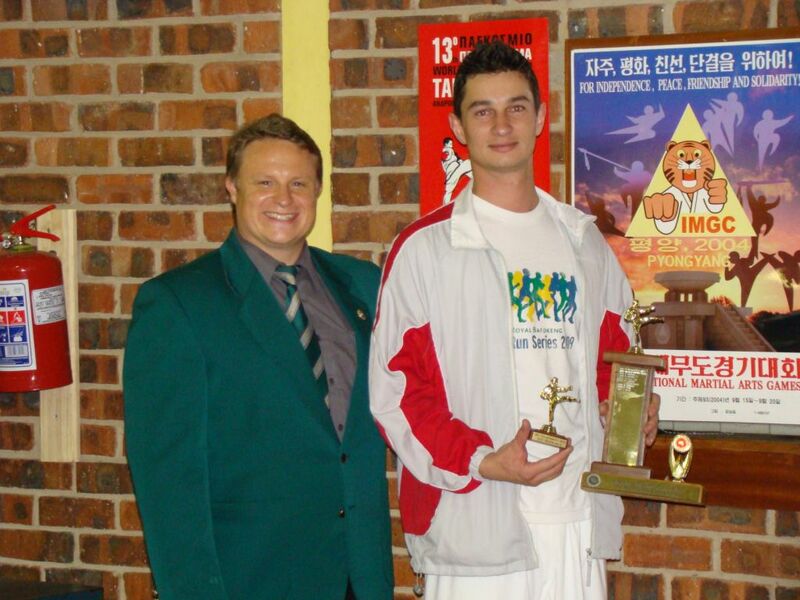 Both are from Pretoria and the Elardus Park Dojang. The wedding took place at the Riverside Castle just outside Pretoria. To both couples, from Karel and Annari Wethmar and all the ATC black belts and students, congratulations with your weddings! The 9th ATC Invitational Tournament took place on Saturday 1 May 2010 at the Gauteng North Wrestling Hall in Menlo Park, Pretoria. 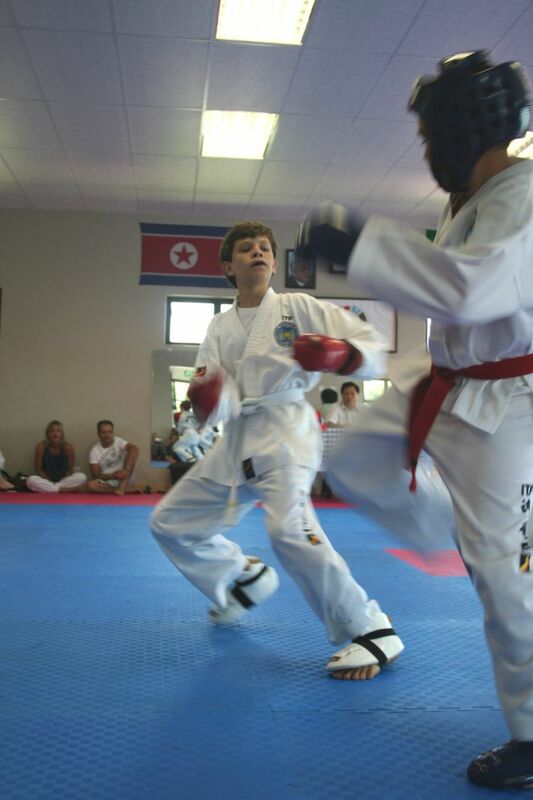 With well over 150 competitors from as far as Port Elizabeth, Pinetown, Richards Bay and Zimbabwe, this tournament has grown into the second largest ITF Taekwon-Do tournament in South Africa behind the annual national championships. 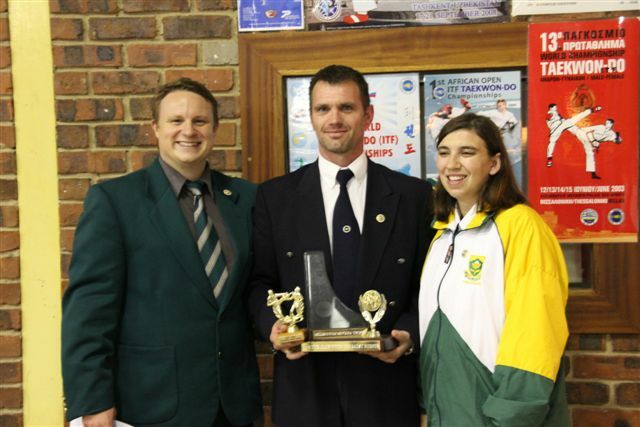 The triumphant club for 2010 was Phoenix Taekwon-Do from Port Elizabeth with ATC in close second place. The organizers would like to congratulate Gerd Hummel and his team form PE with their great performance at this year’s tournament. The Tournament Organizers would like to thank the main sponsors of the ATC Invitational Tournament, Bobby Rizzo and Judy van der Westhuizen from Millennium Minolta for sponsoring the medals and the floating trophies. They would also like to thank Mr. Fuz Loubser and Kreon for their kind contribution to the tournament. Also a special word of thanks to all the students, black belts and families whom helped on the day with refereeing, umpiring, corner judging, working in the tuck shop and assisting at the tables. Without all of your help the day and the tournament would not have been such a huge success as it was! 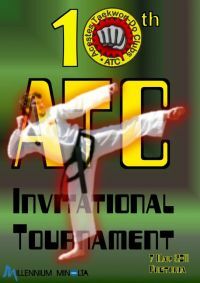 We look forward to seeing everyone at next year’s 10th ATC Invitational Tournament, scheduled for May 2011. A total of 11 members from ATC attended the SA-ITF National Camp over the weekend of 24 to 27 April 2010, at Nylstroom Lodge near Modimolle (Nylstroom) in the Limpopo Province. Cold wet weather, seldom experienced during this time of year in this area, restricted the majority of training sessions to take place inside. The ATC students enjoyed the camp very much and learned a number of new techniques especially with the ground work and grappling training session, presented by Mr. Sean Cremer (instructor from Pinetown). The first certification of SA-ITF instructors, academy heads and federation heads also took place at the national camp, and we are pleased to announce that the 3 federation heads of the Dan-Gun Kwan, Mr. Chris van der Merwe, Mr. Karel Wethmar and Mrs. Annari Wethmar were certified as official SA-ITF federation heads and instructors and also received their certificates and badges at this event. The first ATC Spur evening was hosted on Tuesday evening 13 April 2010 at the brand new Spur in the Woodlands Mall. We can report that this evening was a huge success due to the great turnout of all the club members, their friends and family. The ATC waiters did a splendid job under the leadership of Bobby Rizzo. The hamper containing goods worth more then R2000 was won by Lynda Rieder. 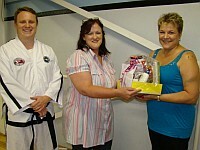 Lynda took ownership of her prize at the Thursday evening class on 15 April 2010. The ATC chief instructors would like to thank Anette Botha for organizing this event with Spur and also building and arranging all the goods and items that went into the hamper which was raffled off during the evening. In addition they would also like to thank Woodlands Spur and all the students, friends and family that supported this evening. We look forward to the next ATC Spur evening scheduled for Thursday evening 13 May 2010 at the Atterbury Value Mart Spur. 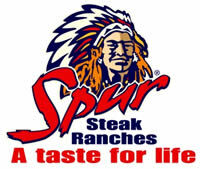 It’s with great excitement that we invite all our students as well as their family and friends, to the ATC Spur evening scheduled for Tuesday 13 April 2010, from 17h00 to 21h00 at the brand new Spur in the Woodlands Mall. A hamper containing various products amongst other items, health products, a R200 Spur voucher etc. to the value of R2000 will be raffled of during the evening. Raffle tickets are R10 each. 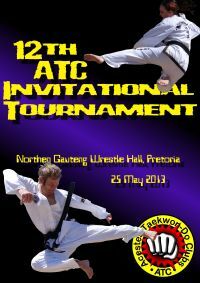 Come see the ATC Taekwon-Do waiters in action! Bring all your family and friends along for a fun-filled evening at South Africa’s most popular family restaurant! 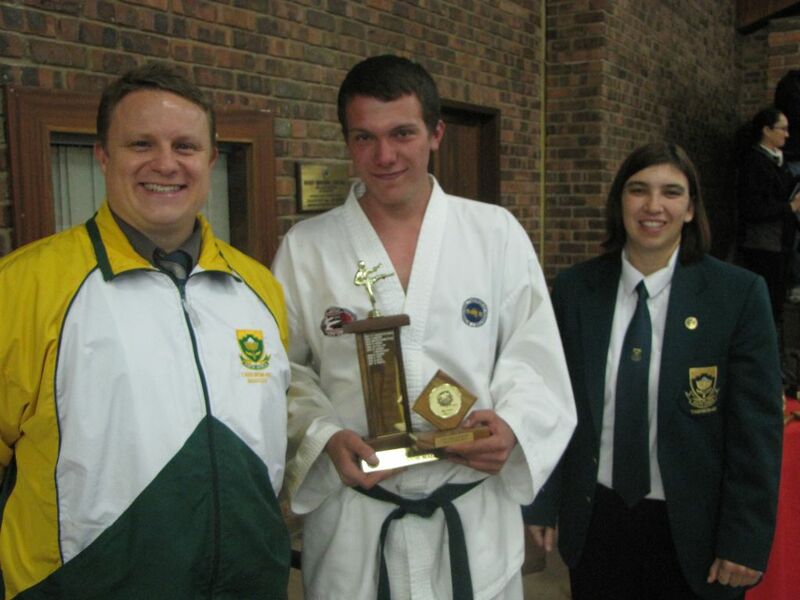 On Sunday 14 March 2010, 10 students from ATC participated in the annual TSA (Taekwon-Do South Africa) tournament, held in the Mandeville Sport centre, Kensington, Johannesburg. There were participant from clubs registered under GTF Taekwon-Do, ITF Taekwon-Do (under Choi Jung Hwa) and ITF Taekwon-Do (under Chang Ung). 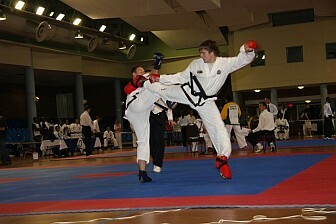 This year the tournament only catered for participation in patterns and sparring. A total of 4 Gold, 4 Silver and 1 Bronze medals were won at this well organised tournament. The chief instructors were very happy with the performance of the ATC competitors and said that they were looking forward to seeing them in action at the ATC Invitational Tournament on the 1st of May 2010 in Menlo Park, Pretoria. On Saturday 6th of March 2010, 3 ATC students participated in the “Yearly Kicking Tournament” hosted by Traditional Tang Soo Do SA, in Klerksdorp, North West province. Since this was an All Styles Tournament, there were participants from various martial art systems in attendance. 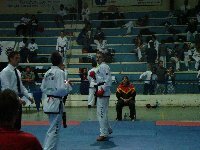 Styles that participated in the tournament included ITF Taekwon-Do, GTF Taekwon-Do, Traditional Tang Soo Do and Shotokan Karate. From everyone at ATC we would like to congratulate these 3 ambassadors of ATC with their great achievements and performance at the All Styles Tournament in Klerksdorp. Black belt certificate for Isabel! 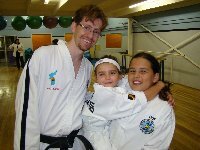 On Tuesday evening of 2 March 2010, Isabel Naude received her 1st degree black belt certificate from her instructors, Annari and Karel Wethmar. Her black belt certificate number is SA-1-251. The black belt certificates are manufactured and issued by the ITF HQ office in Vienna, Austria and signed by our president, Prof. Chang Ung. Congratulations from your instructors and all the ATC students! It is with great pleasure that we announce that Mrs. Annari Wethmar, 4th degree black belt chief instructor of ATC has been promoted to Co-Federation head of the Dan-Gun Federation (Kwan) together with the 2 founding members of the Federation Mr. Karel Wethmar and Mr. Chris van der Merwe. She therefore now serves on the SA-ITF National Council. On behalf of Mr. Wethmar, Mr. van der Merwe and all the ATC students we wish to congratulate you on this great achievement and for always setting such a good example to all of our students. 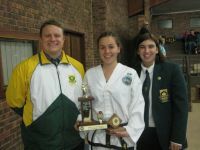 The first colour belt grading of the Dan-Gun Federation (Kwan) for the year 2010, took place on Saturday 27 February 2010 at the Hoërskool (High School) Silverton. 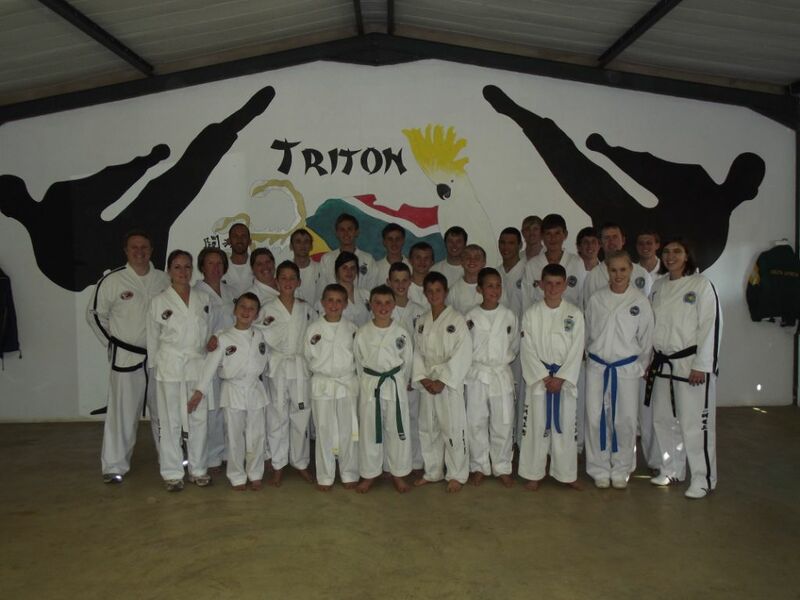 Students from the Dan-Gun Federation (Pretoria), Shim Duk Federation (Vanderbijlpark) and Soo Shim Federation (Potchefstroom) participated in this grading conducted by Dan-Gun Federation co-heads and ATC chief instructors Karel and Annari Wethmar. The grading examiners expressed their content with the standard of the grading. 9 Students participated in the grading and all 9 passed their examinations. 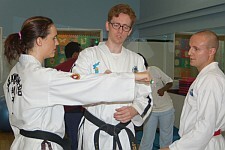 3 Students whom graded to black stripe at this grading had to submit an essay on any Taekwon-Do topic. Click on below icons to view their essays. 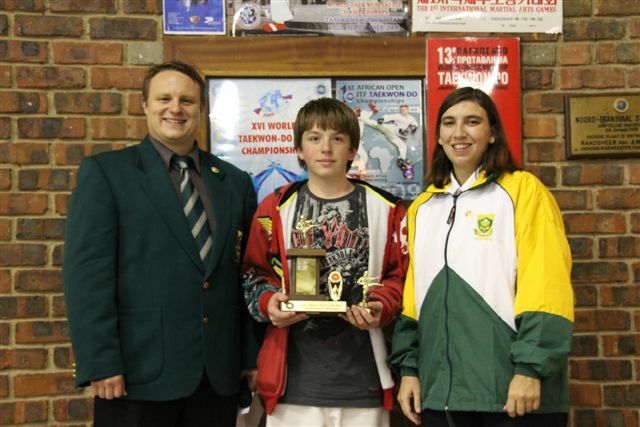 On Saturday 20 February 2010, 3 of ATC’s students participated in the 13th Gauteng Open Tournament held at the Wrestling hall in Primrose, Johannesburg. 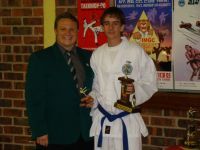 Jaco Botha (2nd degree black belt) assisted as a centre referee with sparring. 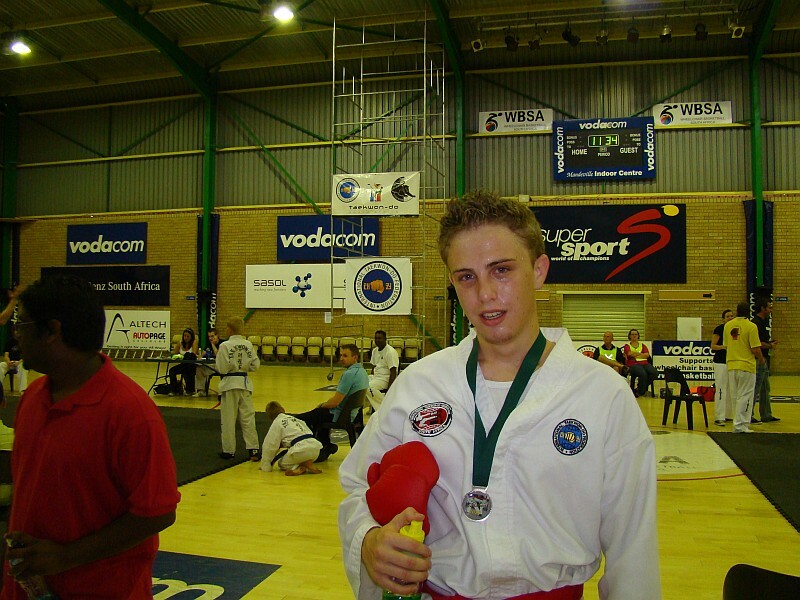 Gustav Gous (1st degree black belt) participated in sparring over 80kg black belt division and won a silver medal. In special techniques he also won a silver medal. 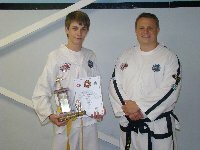 In an open black belt patterns division he ended in 4th place. Gustav also assisted at the tournament as a corner judge and patterns judge. Juan (JJ) Jacobs (Green belt) participated in sparring over 80kg novice belt division and ended in 4th place. 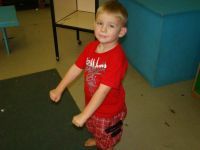 He also participated in patterns where he won a bronze medal. We wish to congratulate these students with their winnings but also thank them for participating and assisting with judging through-out the tournament. On the 23rd of February 2010, the chief instructors of ATC were very proud to hand over Jaco Botha’s 2nd degree black belt certificate, received from ITF HQ, Vienna. 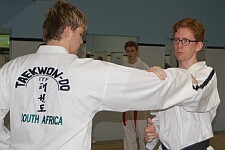 Jaco graded successfully to his 2nd degree under Senior Master Kim Jong Su on 18 April 2009 in Primrose, Johannesburg. His black belt certificate number is SA-2-90. 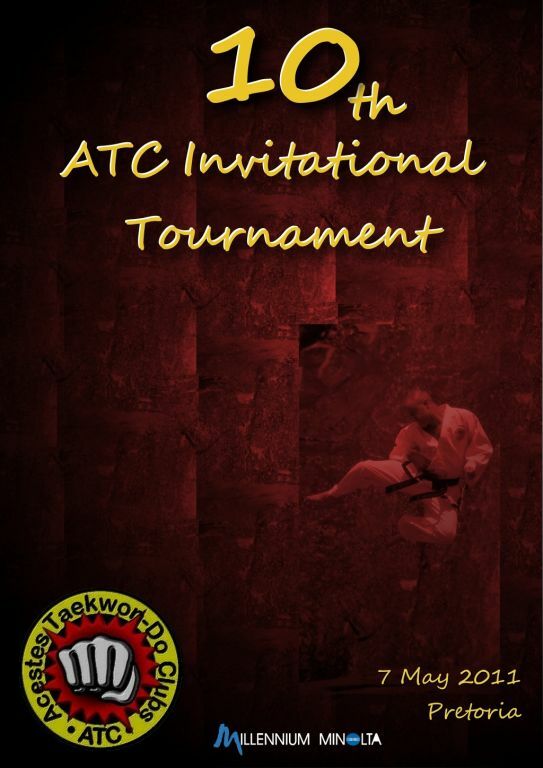 It’s that time of year again that ATC invites you to participate in the Annual ATC Invitational Tournament. The tournament is in it’s 9th year and with participants coming from near and far it promises to be a day of intense competition filled with fun for the whole family. 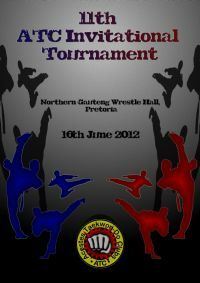 The tournament will take place on Saturday 1 May 2010 in the Northern Gauteng Wrestling Hall in Pretoria, and participants will be able to compete in both patterns and sparring. There will be a prize giving ceremony at the end of the day to honour the winners in all divisions. Do you have the courage to test yourself against the best possible competition at your belt level and in your age category? If you have what it takes register today, and take advantage of ATC’s early registration fee special. Detailed information on the tournament’s location, rules and registration procedures can be found in the complete invitation. 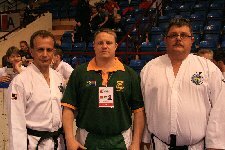 On Thursday 14 January 2010, a great friend of the ATC chief instructors, Mr. Sanko Lewis (4th Degree black belt and Federation head of the Soo Shim Kwan (Potchefstroom)) and his brother Mr. Tiny Lewis (3rd Degree black belt and Federation head of the Shim Duk Kwan (Vanderbijlpark)) visited the ATC Elardus Park dojang for some interesting training as well as a few surprises. Mr. Sanko Lewis is currently on a 12 month work contract in Seoul, South Korea. He works in the department of English studies at the Sahmyook University in Seoul and teaches English and Biblical studies. Currently he is on holiday in South Africa to visit friends and family before departing for Korea on 19 February. He graded to 4th degree black belt in Seoul, South Korea during 2009 and also holds a 1st degree black belt in Hapkido. In addition he also trains Brazilian Jujitsu to advance his knowledge in ground fighting. The hook block from the pattern Yul-Gok was explained in the highest detail to all present and Mr. Sanko Lewis gave very interesting application tips with this hand technique for self defence purposes. A lot was learned by all present, and everyone is looking forward to his next visit. At the end of the class Mr. Sanko Lewis surprised both the ATC chief instructors when he handed both of them brand new instructors doboks from South Korea with the Korea federation badge on the right chest. Mr. and Mrs. Wethmar were overwhelmed with the great presents they received and a photo session soon followed. 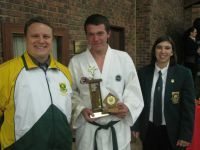 The 2009 ATC year-end function and prize giving took place on Thursday 3 December 2009 at the Elardus Park dojang in Pretoria. This event, which was an informal event this year, coincided with a dinner at the local Romans Pizza restaurant. 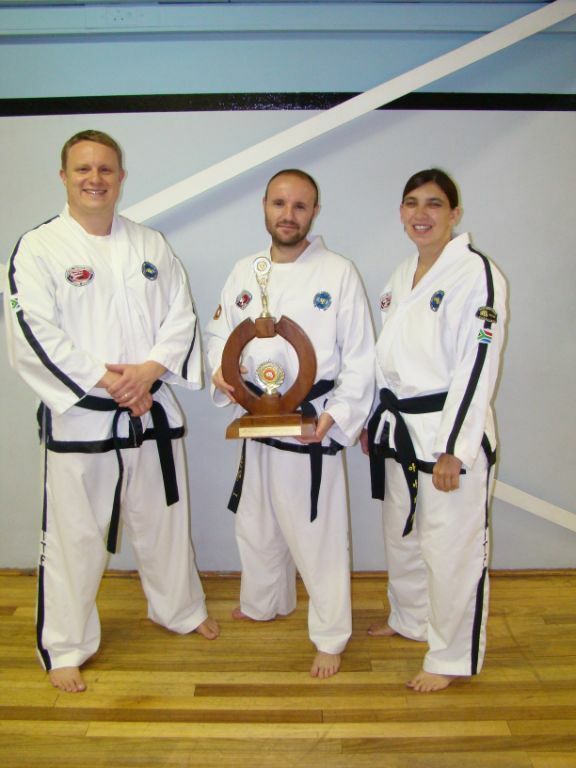 After a blink back over the 2009 Taekwon-Do year by chief instructors Annari and Karel Wethmar, capturing all the highlights of the events participated in by the club over the past year, the prize giving started. 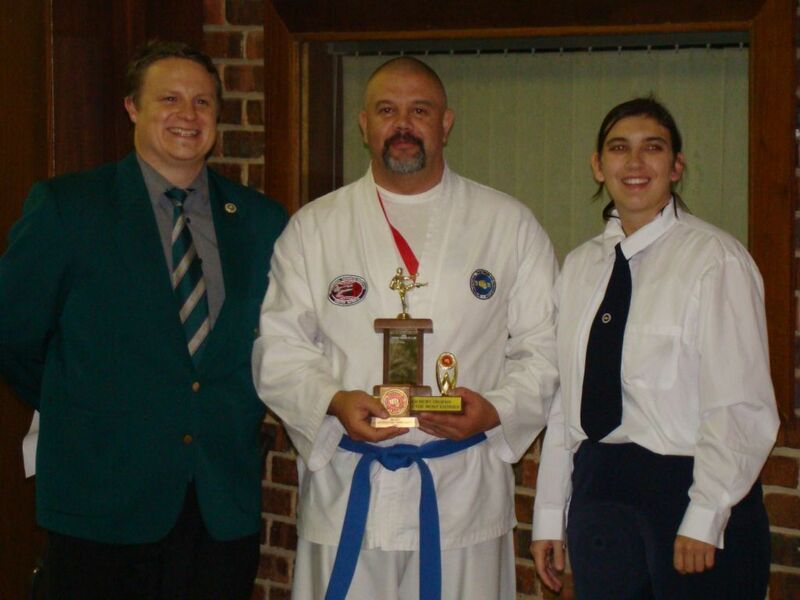 The “ATC Black belt of the year” award went to Manie Naude. The “Most promising student” award went to Susan von Wielligh and the “Most improved student” award went to Carl Joubert. “Tiger of the year” award went to Juane Boonzaaier, “Junior of the year” award went to Matthew Shatkovsky, “Senior of the year” award went to Jaco Botha and the “Veteran of the year” award went to Jan Bezuidenhout. The main award of the evening was the “ATC achiever of the year” award and for the 2009 year it went to Isabel Naude. The last colour belt grading of the Dan-Gun Federation (Kwan) for the year 2009, was held on Saturday 28 November 2009 at the Hoërskool (High School) Silverton or better known as the Silverton dojang. 2 Students from the Shim Duk Federation (Vanderbijlpark) also attended the grading conducted by chief instructors Karel and Annari Wethmar. The standard of the grading was very high and after a day of performing patterns, techniques and theory amongst other grading-events, 16 students passed. Congratulations to the students that passed their grading and keep on training hard. Annari graded to 4th degree black belt! 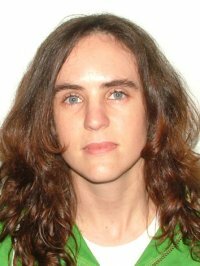 It is with great excitement that we announce that one of ATC’s chief instructors, Annari Wethmar, graded to 4th degree on Tuesday 3 November 2009 and became only the second female in the SA-ITF history to achieve this qualification level. She was graded to 4th degree by Senior Master Kim Jong Su. On behalf of Sabum Karel Wethmar and all the ATC black belts, students and parents we congratulate you on this great achievement! Jaco 5th in power breaking at World Champs! 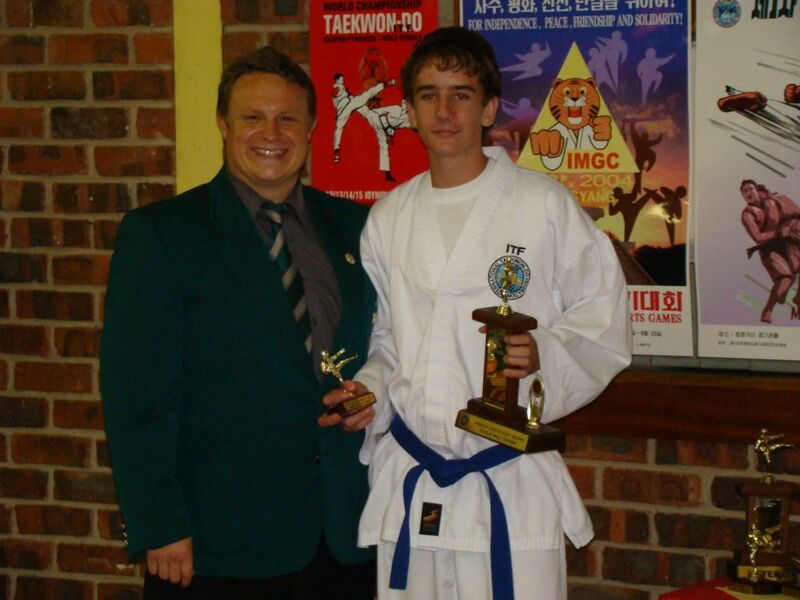 Jaco Botha, 2nd degree balck belt from ATC was selected as part of the SA-ITF National Taekwon-Do Team to participate at the 16th World Taekwon-Do (ITF) Championships, in St. Petersburg, Russia. Jaco was selected to participate in the individual male power breaking division and had to test his strength and technique against 43 other countries’ best in this discipline. He kept ATC’s name high and did superbly by ending 5th overall. He was accompanied by 2 ATC members, Karel Wethmar (Assistant coach) and Jan Bezuidenhout (Team doctor). ATC congratulate Jaco on this great result and achievement! ATC is proud to announce and congratulate Gustav Gous on his successful grading to 1st Degree black belt. He graded to 1st Degree on Saturday 3 October 2009 under Senior Master Kim Jong Su at the Technical Seminar held in Primrose, Johannesburg. 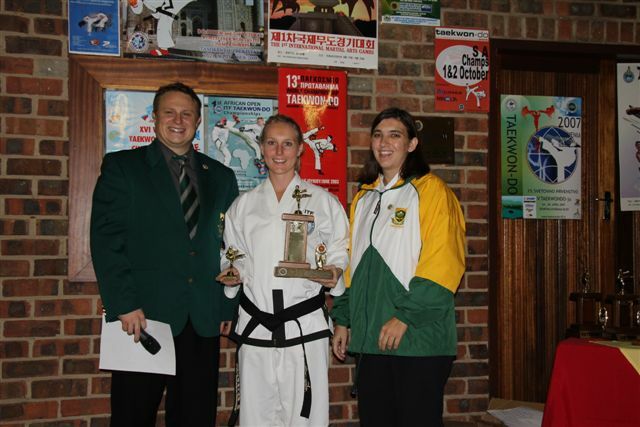 The National SA Championships took place over the long weekend from 24 to 27 September 2009 and was hosted by the Bulsajo Kwan (Phoenix Taekwon-Do club) in Port Elizabeth in the Eastern Cape. Just over 160 competitors from clubs and provinces all over South Africa entered and participated in this prestigious annual tournament. This year saw the first time in 6 years that ATC did not win the SA National Championships. This may be contributed to the fact that only 13 students from ATC participated at this year’s Champs. ATC won a total of 18 medals of which 6 was gold and ended up 3rd overall on points from the 9 clubs that entered. ATC managed to end 1st of all the Gauteng based clubs that entered. Well done! 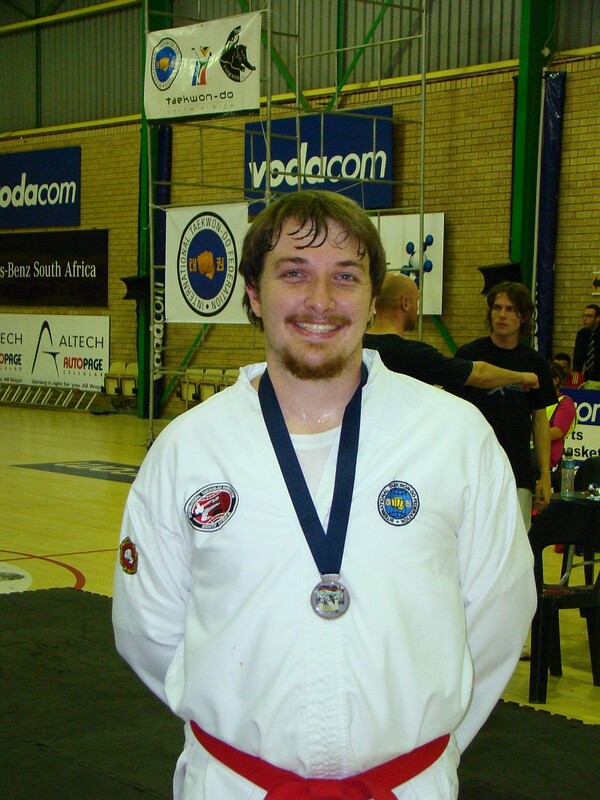 It’s with great excitement that we announce that Jaco Botha (2nd Degree) has been selected as part of the South Africa National Taekwon-Do team to participate in the Senior World Championships in Russia. 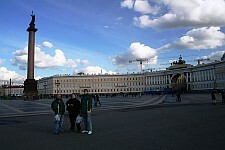 The tournament will be hosted in Saint-Petersburg, Russia on October 12-17, 2009. Jaco has been selected to participate in Power Breaking. He will be accompanied by Assistant Coach Karel Wethmar, and Team Doctor Jan Bezuidenhout. 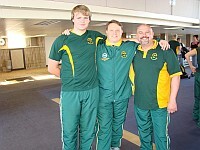 Fundraiser For Jaco, SBM Karel (Coach), Oom Jan (Medic) to attend the Taekwon-Do world Champs in ST. PETERSBURG, Russia. Mongolian Grill is GREAT fun. Please come and join us and have a memorable evening with friends. There might just be a lucky draw. For R80 you can set your own menu and eat as much as you can – includes starters, main meal and pudding. There will also be a Thank You dinner after the World Champs where BIG PRIZES will be auctioned! Invite as many people as you can. The more there are the more we make. 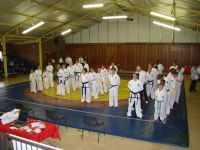 On Saturday 6 June 2009 the 2nd colour belt grading of the Dan-Gun Federation for the year 2009 took place in Silverton, Pretoria. Students from the Vaal River Taekwon-Do clubs in Vanderbijl Park together with ATC students from the Elardus Park, Silverton and Cullinan dojangs took part in the colour belt grading conducted by Karel Wethmar (4th degree) and Annari Wethmar (3rd degree). They were assisted by their assistant instructor Manie Naude (2nd degree). The standard of the grading was of a very high level and with nerves running a ray with most of the students, the grading was overall very successful. Congratulations to the students that passed their grading, and to those who did not pass, persevere and train even harder for your next attempt! 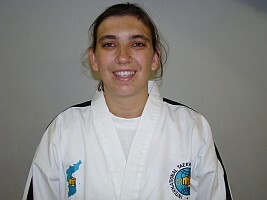 ATC is proud to announce and congratulate Isabel Naude on her successful grading to 1st Degree black belt. 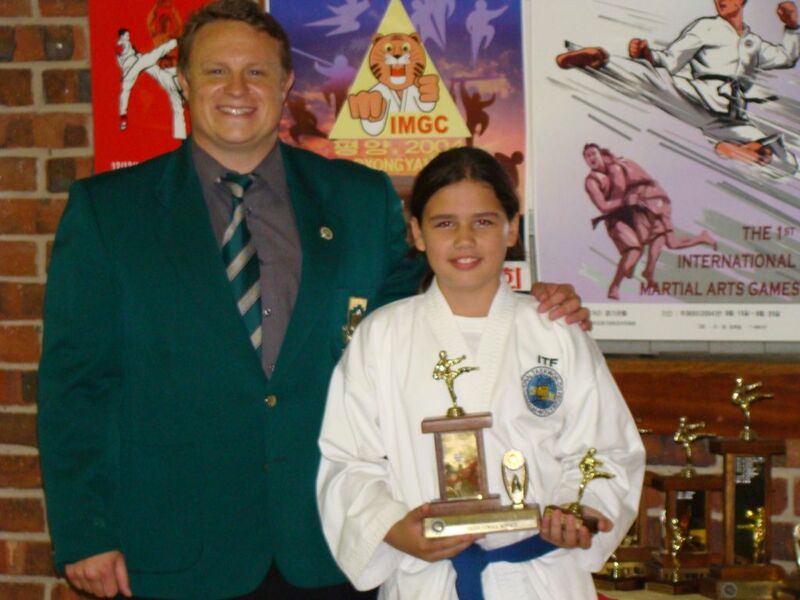 She graded to 1st Degree on Saturday 30 May 2009 under Senior Master Kim Jong Su at the Technical Seminar held in Primrose, Johannesburg. The 8th ATC Invitational tournament was held on Saturday 23 May 2009, at the Gauteng-North Wrestling hall, Menlo Park, Pretoria. 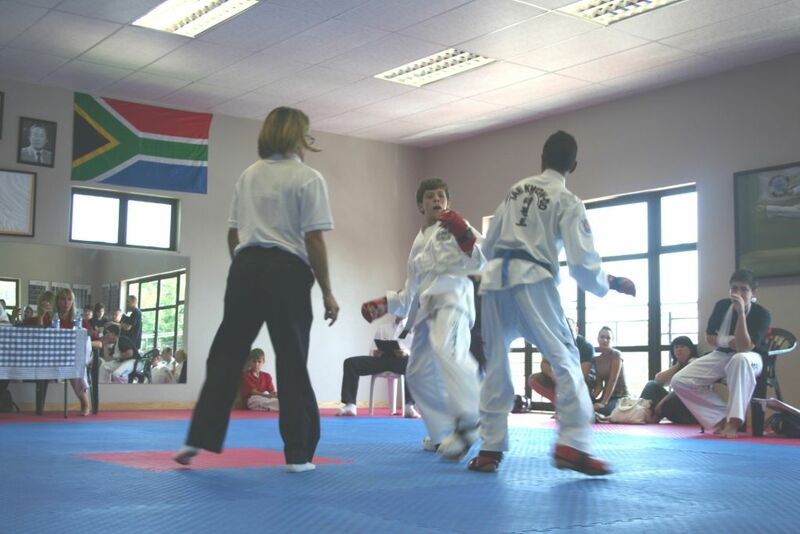 Just over 150 competitors from as far away as Robertson, Western Cape, Richards Bay and Pinetown, Kwazulu Natal and Zimbabwe came to participate in what has, in recent years, become one of the pinnacle Taekwon–Do events on the SA-ITF calendar. The tournament was extremely successful, with all ages and belt groups participating in their respective categories. With strong competition from the Dias Taekwon-Do Club (from the South of Johannesburg), Pil Sung (from Kempton Park) and ATC (from Pretoria) all the categories were greatly contested and the tournament was engaged in a good spirit by all competitors and supporters. The Tournament organizers would like to thank the main sponsors, Millenium Minolta, for sponsoring the tournament medals. They would also like to thank Mr. Deon Vrey, Mr. Fred Botha, Mrs. Annette Botha and Inspecta Cars Centurion for their contributions. A special word of thanks to the 2 most senior people present on the day, Senior Master Kim Jong Su (7th Degree) for assisting as jury president and Shaheed Karachi (4th degree) for judging and centre refereeing the entire day. Also a special word of thanks to all the students, black belts and families whom helped on the day with refereeing, umpiring, corner judging, working in the tuck shop and assisting at the tables. Without all of your help the day would not have been as successful as it was! 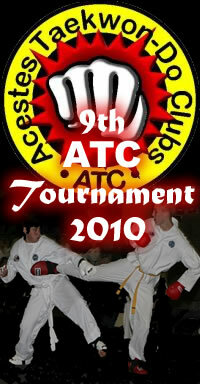 Hope to see you all at next year’s 9th ATC Invitational Tournament, scheduled for May 2010. 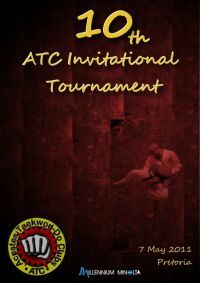 It’s that time of year again that ATC invites you to participate in the Annual ATC Invitational Tournament. The tournament is in it’s eighth year and with participants coming from near and far it promises to be a day of intense competition filled with fun for the whole family. 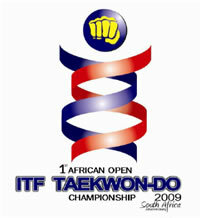 The tournament will take place on Saturday 23 May 2009 in the Northern Gauteng Wrestling Hall in Pretoria, and participants will be able to compete in both patterns and sparring. There will be a prize giving ceremony at the end of the day to honour the winners in all divisions. 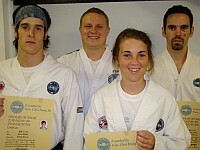 On the weekend of 25 & 26 April 2009, 3 ATC students participated in the 2009 Elite Johannesburg Championships hosted by Magua Taekwon-Do at the Mandeville Sports & Social Centre in Kensington, Johannesburg. This a multi Taekwon-Do federation tournament where the SA-ITF team consisting of our 3 ATC students and 4 other SA-ITF members, competed against the TSA (Taekwon-Do South Africa) and GTF (Global Taekwon-Do Federation) teams in patterns, sparring, power breaking and special techniques. Our students held the ATC name high (as always) returning with 5 gold, 2 silver and 3 bronze medals. Matthew made us especially proud and showed the big guys how it’s done by winning, as a junior, the senior intermediate power breaking category. 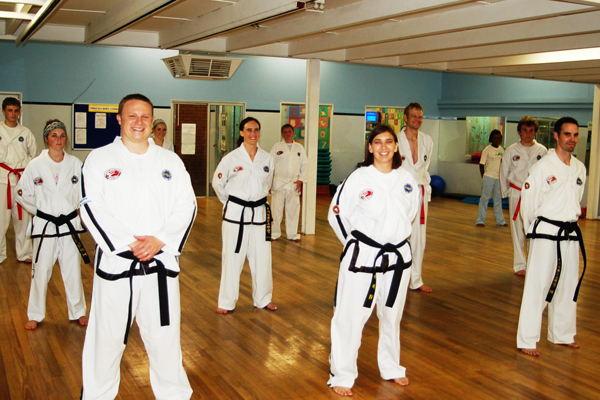 Newly graded ATC black belts! 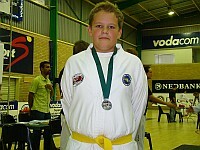 Milandi Coetzer, graded to 1st Dan on Saturday 22 November 2008. Congratulations to the following ATC black belts whom received their black belt certificates from ITF Head Quarters in Vienna on 25 March 2009. 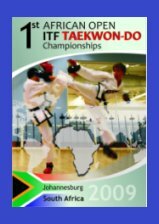 On the weekend of 20-22 March 2009, saw the inaugural ITF Taekwon-Do Africa Open Tournament, held in the Walter Sisulu Sports Hall, Randburg, South Africa. With participants from South Africa, Lesotho, Mozambique, Zimbabwe, Ethiopia, Madagascar, Nigeria, Morocco, India and the UK, this was a tournament with no parallel ever hosted in South Africa. 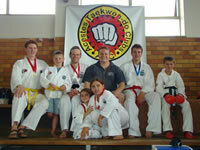 10 Students from the ATC Taekwon-Do Clubs were included in the SA team. A total number of 18 medals were won by our clubs’ students, with 5 gold, 7 silver and 6 bronze making up the spread. The club congratulates our students with their exceptional performance at this first international tournament held in South Africa! 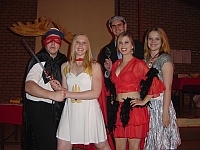 The 2008 ATC year-end function was held on Friday 28 November 2008 with “Masquerade” as the theme for this gala evening. Everyone was dressed in formal evening attire with all the various masques one can acquire in Venice, Italy. 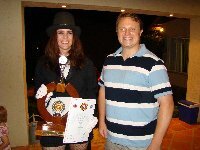 As in the past this event also presents the club’s annual prize giving and the students were looking forward to the announcing of the winners of the floating trophies for 2008. It was an evening fun filled with exceptional food, prize giving, and the screening of video clips, presented to the audience on the overhead projector, capturing the major highlights of the events the club members participated in during the year of 2008. For a complete list of all the winners of the 2008 floating trophies please visit the “Roll of honour”. 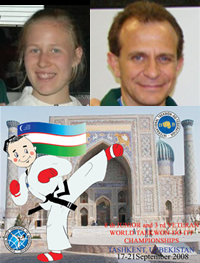 Karlien Els (2nd Degree) and Bobby Rizzo (1st Degree) kept ATC’s name high at the past 8th Junior and 3rd Veteran World Championship, held in Tashkent, Uzbekistan from 17 – 21 September 2008. 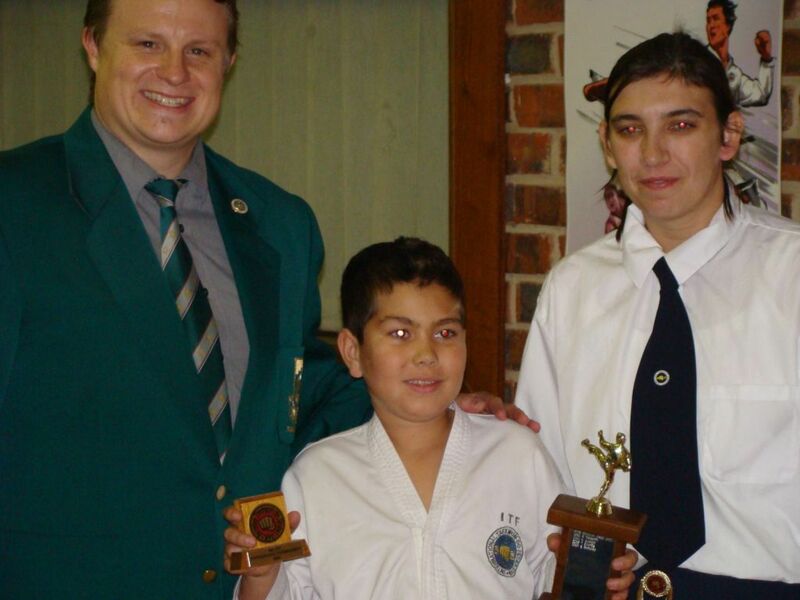 Between the 2 of them they won 2 silver and 1 bronze medals, out of the total of 6 medals won by the South African National Taekwon-Do team at this prestigious event. 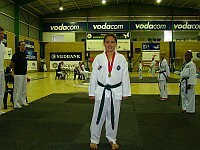 Karlien won a silver medal for 2nd degree patterns junior females. Bobby won a silver medal for power breaking veteran males and a bronze medal for sparring veteran males under 73kg. We congratulate both of you with your great results and achievements! 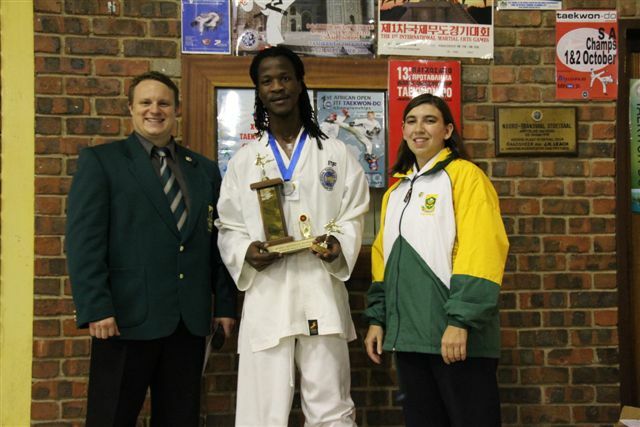 Over the weekend of 19 to 21 September 2008, the ATC Demo team departed from Pretoria and headed to Robertson, Western Cape Province, to entertain the town to some spectacular ITF Taekwon-Do demonstrations. 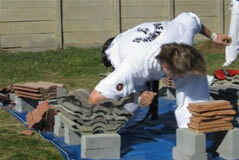 The demonstrations were held to promote the new ATC Robertson dojang started by Stephan Maritz (3rd Degree). 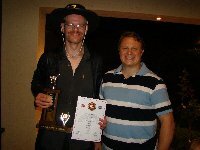 The team under leadership of Manie Naude (2nd Degree), consisted of Jaco Botha (1st Degree), Isabel Naude, Gustav Gous, Marco Bezuidenhout, Mike Laubser, Roland Arnold and Matthew Shatkovsky. The team performed their Taekwon-Do demonstration over 2 days starting with the first on Friday 19 September at the offices of the South African Police Services in Robertson. The second demonstration took place on Saturday 20 September at the Callie de Wet Sport Stadium before the start of the local club rugby match. 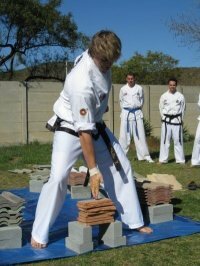 With 540 degree kicks performing breaks, back flips, to impressive power breaking all the way to some self defence routines were some of the techniques used to entertain the crowds while Stephan Maritz explained to all present what was happening and the use there of. All in all the demonstrations were met with a lot of interest and enthusiasm and an awe inspired crowd that will start with Taekwon-Do soon. 5 years in a row of SA Champs victory for ATC! 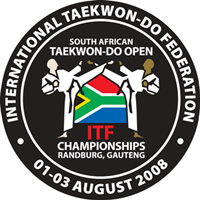 On 2nd and 3rd August 2008, the Walter Sisulu Sports Hall in Randburg, Johannesburg played host to the largest SA-ITF Taekwon-Do Tournament of the year: The SA National Championships. Competitors came from as far away as Port Elizabeth, Cape Town and Zimbabwe to compete against the very best Taekwon-Do practitioners that Gauteng has to offer in Patterns, Sparring, Special Techniques, Power Breaking, Team events and Self-Defense. With over 280 participants arriving from all parts of the country to compete in what is notorious for being the toughest competition of the year, the ATC do-jangs prepared themselves for the onslaught. From the small, but superbly trained Stingers from Durban to the titanic clubs of Phoenix and Magua, we knew that we would have our work cut out for us over the next two days. It can definitely be said that we did not disappoint. Over the two days that followed, ATC dominated events. From the epic, well-crafted self-defense routines to raw displays of strength and speed in sparring and power-breaking, blue Gauteng North tracksuits occupied the winner’s podium with startling regularity. When the final points had been tallied, ATC had won by over 60 points and also won the most medals a total of 57 (22 Gold, 28 Silver and 7 Bronze), making it the first club in the history of the SA-ITF to win the SA National Champs 5 years in a row. 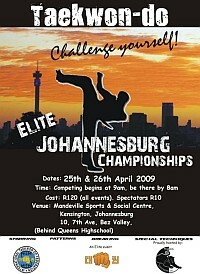 See below the SA Champs final results for 2008. On Saturday 14 June 2008 the 1st Gauteng North ITF Taekwon-Do Tournament took place in Silverton, Pretoria. 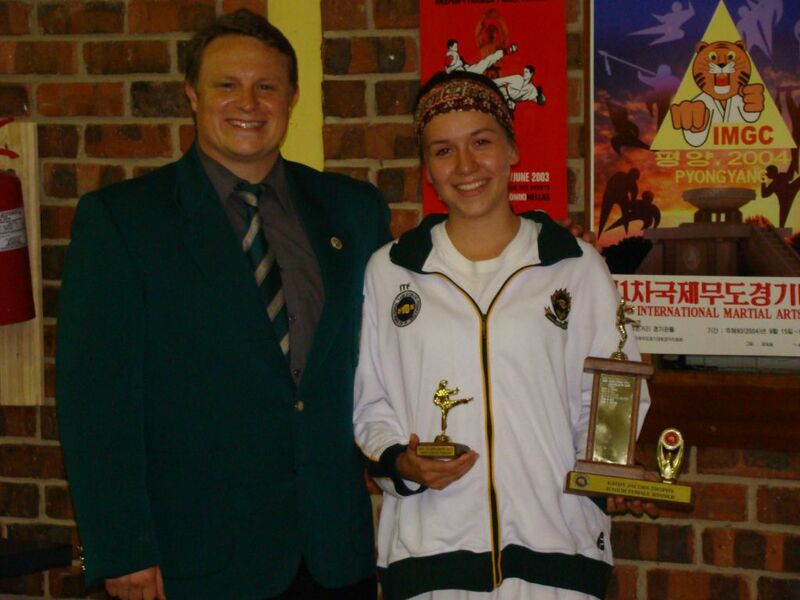 This important tournament marked the beginning of a new era in South African Taekwon-Do, bringing as it did a formal environment under which Gauteng North colours may be awarded. It may also go down in history as the quickest tournament ever conducted in the SA-ITF. The competition started at eight ‘o clock in the morning and by one ‘o clock, every single event had been conducted, from white belt patterns and sparring through to black belt power-breaking and special techniques. My understanding is that this was a demonstration of how an efficiently run tournament can be conducted painlessly and quickly and had nothing whatsoever to do with the fact that South Africa were playing against Australia in the Tri-Nations at two o’ clock. The competition, though quick, was furiously contested as participants fought for the limited number of slots open on the Gauteng North Team (colours only being awarded to the top two competitors in each division). 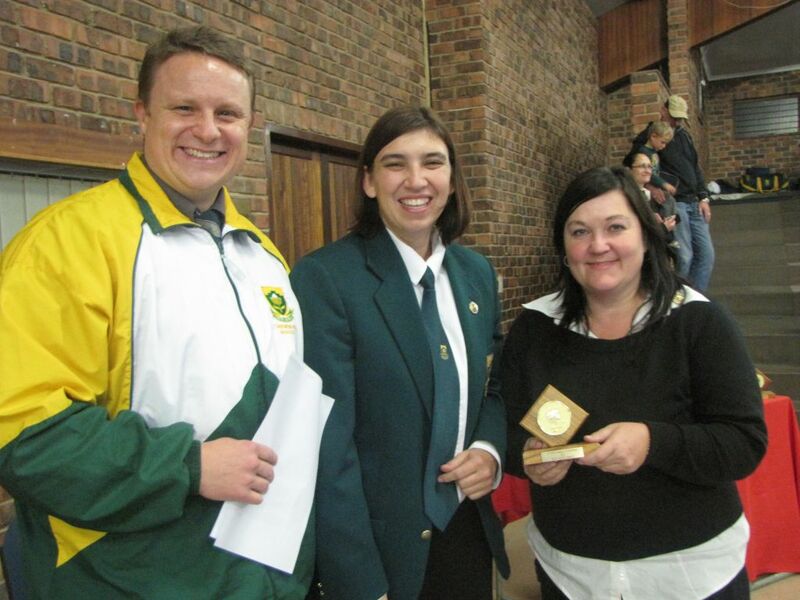 A total number of 44 ATC students received their Gauteng North Provincial Colours on the day. We congratulate all of them on this great achievement. Karlien and Bobby selected for the 8th Junior and 3rd Veteran World Champs! It’s with great excitement that we announce that 2 of our Black belts, Karlien Els (2nd Degree) and Bobby Rizzo (1st Degree), has been selected as part of the South Africa National Taekwon-Do team to participate in the 8th Junior and 3rd Veteran World Championships in Uzbekistan. The tournament will be hosted in the capital city of Tashkent from 17 to 21 September 2008. Karlien has been selected to participate in 2nd Degree patterns, sparring under 52kg and special techniques for junior females. Bobby has been selected to participate in 1st Degree patterns, sparring under 73kg and power breaking for veteran males (40-49 years). They will be accompanied by their coach and instructor Karel Wethmar. We wish them all the best with the final months of preparation and best of luck to them and the rest of the Protea team at the tournament. Keep our country and club’s name high! 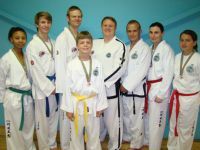 ATC black belts grade successfully! Three black belts from the Acestes Taekwon-Do Clubs graded to their next level on Saturday 24 May 2008, under Master Kim Jong Su at the Northern Gauteng black belt grading, hosted at the ATC Silverton Dojang in Pretoria. Karlien Els graded to 2nd Degree. The 7th Annual ATC Invitational tournament took place on Saturday 10 May 2008, at the Northern Gauteng Wrestling hall, Menlo Park, Pretoria. 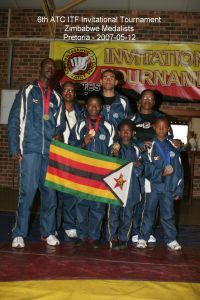 Over one hundred competitors from as far away as Zimbabwe came to participate in what has, in recent years, become one of the pinnacle Taekwon – Do events in South and Southern Africa. Seven ‘o clock in the morning saw the hall swarming with activity as ATC students and instructors raced around putting up banners, setting up sparring rings and trying to figure out how the gas braai worked (which is still largely a mystery). After the opening ceremony at 9 ‘o clock, the tournament began in earnest. 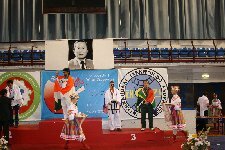 The morning allowed spectators to witness the grace and powerful beauty of Taekwon – Do patterns, elegantly demonstrated by Taekwon – Doins ranging in rank from yellow stripe to advanced level black belt. In contrast, the afternoon bore witness to some furiously competitive sparring, as the best clubs in the country matched their skills against one another. In spite of the incredible aggressive spirit portrayed by all members of the participating clubs, an extremely high level of fair play was displayed as well, with winners and losers alike smiling broadly as they walked from the field of battle, most pausing to congratulate their opponents on their performance and applauding the presentation of medals to participants from rival clubs. All in all, the tournament was extremely successful, with the tenets of Taekwon – Do (courtesy, integrity, perseverance, self-control and indomitable spirit) being shown in abundance by all who were present, ensuring that the ATC Invitational will continue to be a much-loved and integral part of the SA-ITF calendar for many years to come. We would like to take this opportunity to thank our main sponsors, Millenium Minolta, for sponsoring the medals and water bottles for each participant on the day. Also a special word of thanks to all the students, black belts and families that helped on the day with refereeing, umpiring, corner judging, working in the tuck shop and assisting at the tables. Without all of your help the day would not have been as successful as it was! Hope to see you all at next year’s 7th ATC Invitational Tournament, scheduled for May 2009. 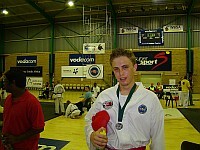 The TSA Tournament for 2008 took place on 12 and 13 April, at the Vodacom Mandeville Indoor Sport Centre in Johannesburg. With four clubs from four different Taekwon-Do styles, ATC - ITF(Chang Ung), Magua - ITF(Choi Jung Hwa), Franks - GTF and WTTU entering the tournament, it was set to be an exciting one. After a warm welcome from Norman Magua the tournament host, the tournament began, running efficiently and effectively. The tournament consisted of four events: patterns and sparring on Saturday and power breaking and special techniques on Sunday. Many things varied in this tournament in comparison to others. Despite the differences in the events themselves, students walked around in an interesting variety of doboks and belts. The patterns were one of the most fascinating and entertaining events to watch and participate in as the styles varied greatly between the clubs. The numbers depleted significantly on Sunday as only the brave survived for power breaking and special techniques – in addition to the fact that some of the clubs don’t offer these events. A definite highlight was Milandi Coetzer from ATC, as the smallest and youngest girl in her division, taking gold for power breaking – along with her achievements in patterns, sparring and special techniques. The vibe and atmosphere of the whole weekend was lively and high-spirited and it was fantastic for everyone to experience a different challenge. The ATC camp for 2008 was held in the Waterberge (mountains), near Nylstroom at the Bayete Adventure School. From Friday 28 March to Sunday 30 March a hectic programme of training, playing games, fitness, a skid play and the odd obstacle course had to be worked through. On Friday afternoon the group of 33 students was divided into five groups that would participate against one another over the course of the weekend in various activities. The touch rugby match of 2 hours started and everyone enjoyed thoroughly. After dinner a lecture was given by Karel Wethmar (Chief Instructor) about General Choi Hong Hi’s life and his accomplishments, followed by a lecture from Chris van der Merwe (Instructor) on Moral culture. The evening was topped of with a video session filled with music videos and photos of ATC activities since 2003. Saturday started with some intense Taekwon-Do training, sparring training and 3 legged sparring with a partner. This training was followed with egg throwing, some “Boere”-sports, swimming, a cricket match or 2, the challenging obstacle course (in the mud, through the mud and with the mud) and further training for the skid play to take place on the Sunday. 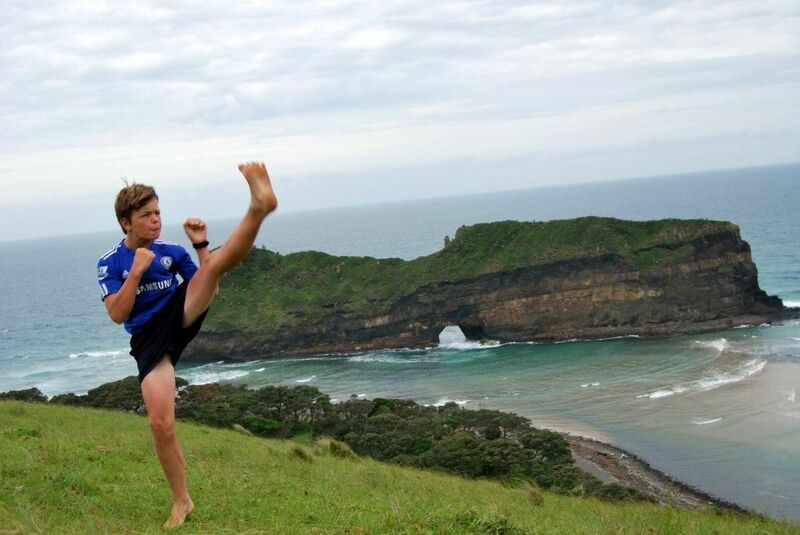 On Sunday training started at 6h00 with hand and foot techniques with Josua Oosthuizen (Assistant Instructor), and patterns training with Karel. After breakfast the groups were locked in a battle on the “literia”-course and this was followed with some “Foefie”-sliding over the dam. Some students enjoyed the 12m high jump into the dam, whilst the rest enjoyed the reactions of the jumpers. At 14h00 the skid play took place and the camp was ended of on a high note, with a prize giving ceremony handing out the camp attendance certificates. We would like to thank Annari Wethmar (Chief Instructor) for organizing this great event! Once again Ascestes Taekwon-do Clubs (ATC) has the pleasure of inviting you to participate in the Annual ATC Invitational Tournament. The tournament is in its seventh year and with participants coming from near and far it promises to be a day of intense competition filled with fun for the whole family. 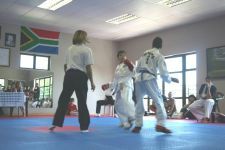 The competition will take place on Saturday 10 May 2008 in the Northern Gauteng Wrestling Hall in Pretoria, and participants will be able to compete in both patterns and sparring. There will be a prize giving ceremony at the end of the day to honour the winners in all divisions. Do you have the courage to test yourself against the best possible competition at your belt level and in your age category? If you have what it takes register today, and take advantage of ATC’s early registration fee. We all enjoy having an excuse to celebrate and throw a party and Valentine’s Day is one of those days in the year that gives us an excuse to do just that. ATC is no exception and uses the celebratory day as an excuse for a class with a little bit of a difference. The first significant change is to our doboks, exchanging our belts and tops for red shirts and adorning our hair and bodies with red ribbons, make-up and the like. Of course, recognition and acknowledgment has to be given to those who put in that little bit of added effort and Janet Loubser, sashaying in to class with her red cape and Valentine’s accessories took top honours for “Best Dressed”. The class was then divided into five teams, who each had their own special team names and war cries. The teams were: Krokkewanjastruisvoëls, Super Moose, The Reds, Love Bugs and Reflex. The games and activities deviated from our normal training somewhat as it involved relays, knocking over coke bottles and shooting targets with Boosabum Karel and Annari Wethmar’s state-of-the-art weaponry. Reflex were the overall winners, but there were plenty of prizes for everyone. Chocolates and sweets literally rained downed on the class, as Boosabum Karel repeatedly managed to trip over the flat floor and always happened to be holding teeth-rotting, sugared delights in his hands. Overall, it was a great class filled with lots of laughter and sugar highs. On the 2nd and 3rd of February 2008, Karel Wethmar and his wife Annari Wethmar (Chief Instructors from the Acestes Taekwon-Do Clubs (ATC)), organized an intensive and well structured extracurricular seminar on the basics of the statistically most effective self-defence techniques taught by Sean Cremer (3rd Degree Taekwon-Do Instructor and Qualified Strategem Instructor) and Grant Lilly (2nd Degree Taekwon-Do Instructor and Strategem Instructor), with the purpose of expanding the self defence repertoire of the attendees and coming close to grasping the importance of knowing both the theory and the practical side of close combat. 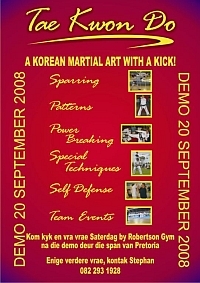 During the full 10 hours of intense training over 1 ½ days, the students that attended knowingly went through the series of drills, locks, and falls that were on hand, attentively listened to the theory of this specialty of fighting, and happily suffered the multiple bruises and sore muscles that would result from the training. The topics covered went from hand to hand close combat to using different weapons, both traditional and modern. Some of the weapons used in the exercises were: gun, knife, short stick, and others. Some of the techniques employed in the fighting exercises belong to different martial arts such as Jiu-jitsu, Judo and other grappling styles. In conclusion, many thanks go to Karel, Annari, Sean and Grant to all the effort put forth in the organizing and bringing to pass the seminar. Truly it was an eye opener to the various forms of fighting available and awareness of how important it is to have a well rounded training program that covers all the different scenarios that could arise during a confrontation. Having the privilege of learning these extra techniques is truly something not to be missed on purpose, and makes the ATC dojang, Karel and Annari teaches in, a worthy place where we are assured we will not only get some of the best training in the country as far as ITF Taekwon-Do, but a myriad of other techniques that are very useful, precise, practical and even fun. Thanks Karel and Annari! 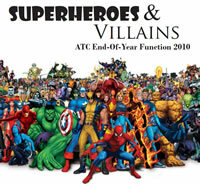 Superman, She-Ra and Shrek – amongst many others – all made an appearance at the ATC End-of-Year Function on 1 December 2007. 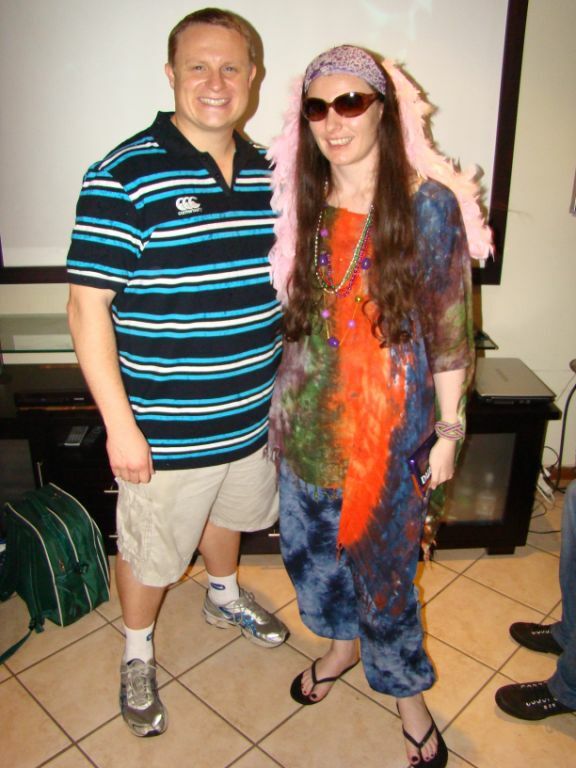 The aim of the evening’s theme was to dress up as anything beginning with the letter ‘s’ (Afrikaans or English). Everyone tapped into their creative juices to come up with some innovative ideas, which resulted in a colourful collection of characters. The evening was filled with good food and lots of music and, of course, the awards ceremony. 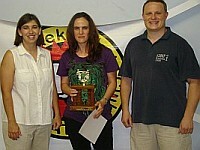 Jolan Botha, Michael Loubser, Jan Bezuidenhout, Gustav Gous and Arnu Nepgen were the recipients of the tenet trophies. They received acknowledgement for courtesy, integrity, perseverance, self-control and indomitable spirit, respectively. 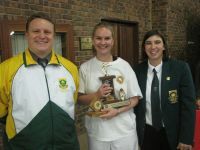 Danniell Botes walked away with the trophy for “Best Improvement” and Karine Roux was awarded the title of “Most Promising Student”. 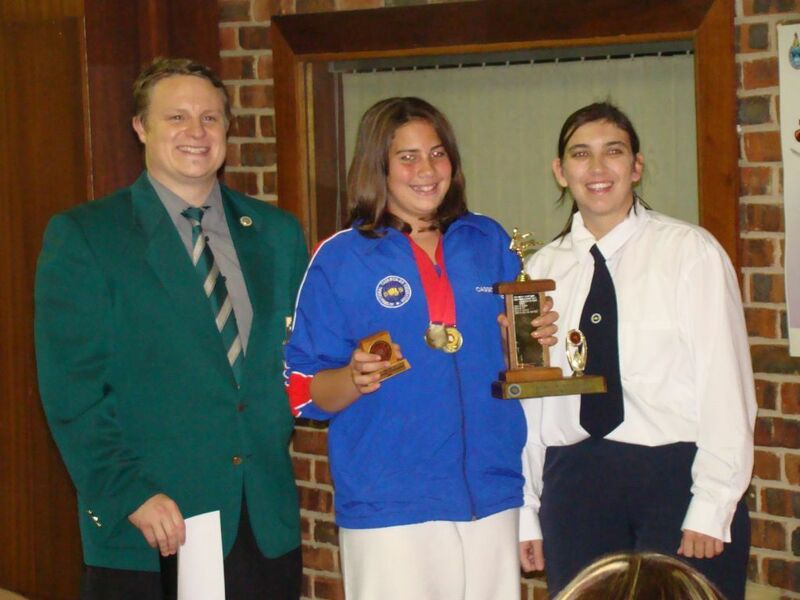 As well as being the “Junior of the Year”, Milandi Coetzer was named the “Achiever of the Year” and “Black Belt of the Year” went to Manie Naude. For a complete list of all the winners, please consult the roll of honour. Altogether it was a fun and busy evening that celebrated an exciting and successful year for ATC and ushered in the start of what promises to be an even greater year. 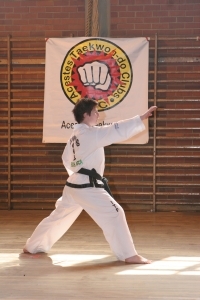 On Saturday, 27 October 2007, Acestes Taekwon-Do Clubs (ATC), took part in the Taekwon-Do demonstration in Lydenburg, Mpumalanga. The demo formed part of the activities that took place at the Kwena Fest in Lydenburg over the weekend of 26-28 October 2007, and was arranged by Boosabum nim Willem Kok, Chief instructor of the Hwa Rang Taekwon-Do Clubs. 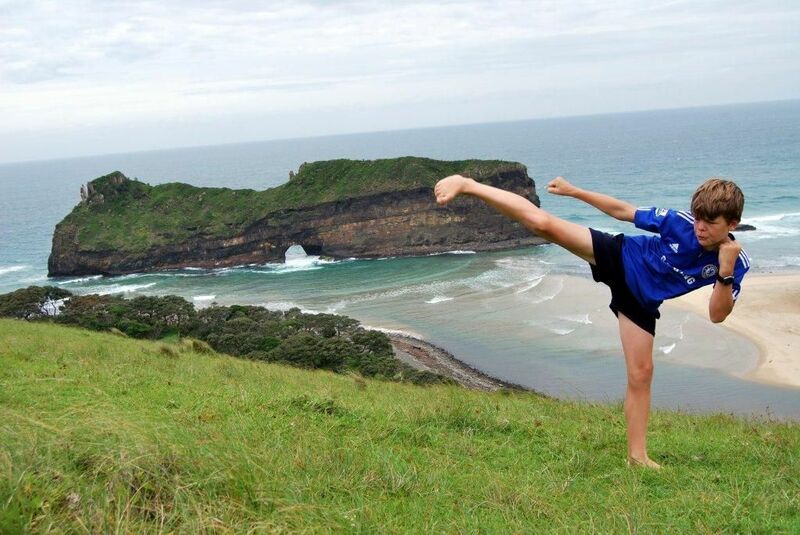 He will be opening his new Lydenburg dojang early January 2008 at Hoërskool Lydenburg. After a 3 hour drive from Pretoria to Lydenburg, the roof tiles and pine wood was setup as planned and the 15 male/female ATC demo team warmed up in preparation for the demo, on a cold and gloomy day. With no time to relax the demo started, wood and roof tile pieces started flying. People were flying through the air in different ways, as the students from ATC demonstrated self defense, patterns, power breaking, sparring and special techniques. As usual this was great fun and the demo team is looking forward to their next event! 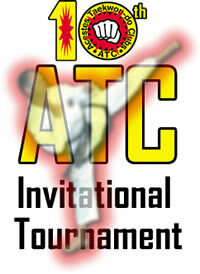 On Saturday, 6 October 2007, the instructors from ATC hosted the 1st Dan-Gun Invitational Tournament at the North Gauteng Wrestling Hall in Menlo Park, Pretoria. Even though there was a power failure (power shedding) in Menlo Park, Pretoria, half way through the tournament, the tournament finished as planned. With students from the Vaal River Tigers, Hwa Rang dojang (Vaal), Potchefstroom, Juche in Pretoria, Dias Taekwon-Do and ATC from Cullinan and Pretoria, participating in the tournament, the tournament was very well attended and enjoyed by all. The 1st Dan-Gun Tournament made provision for competition in Sparring, Patterns, Power Breaking and Special Techniques. The 1st Dan-Gun Invitational Tournament was a huge success and the instructors would like to take the opportunity to thank all the instructors and students that assisted with judging and refereeing through-out the day. Without all of you this day would not have been such a great day of Taekwon-Do fun! 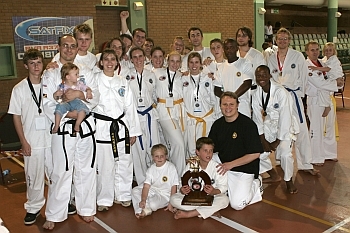 Acestes Taekwon-Do Clubs (ATC) was the overall winner of the 2007 SA Champs, held in Randburg, Gauteng, with a total of 217 points. Jungshin Taekwon-Do Clubs from Johannesburg was closely second with 210 points. This was the 4th year in a row that the Acestes Taekwon-Do Clubs have won this prestigious award, by accumulating the most points at the National Championships. All in all, the club managed to accumulate a total of 67 medals at the tournament, spread between 25 gold, 25 silver and 17 bronze medals. The chief instructors of the club, Karel & Annari Wethmar said that they were very proud of their students’ great effort, and apart from everyone’s great achievements, the spirit was exceptional. 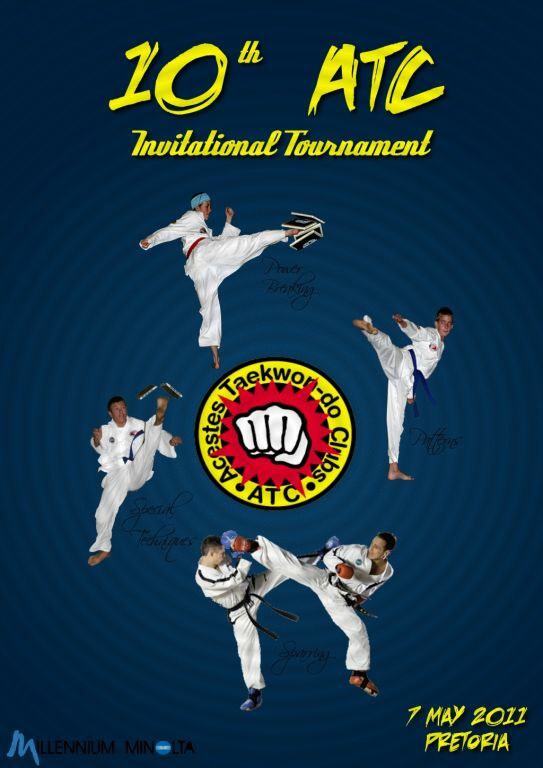 It is with great excitement that the Acestes Taekwon-Do Clubs invites you to the 1st DAN-GUN Invitational Tournament on Saturday 6th October 2007 at the Northern Gauteng Wrestle Hall. The tournament will start with registration at 07h30, and will aim to start the prize giving at 16h00. Enter before Wednesday 3 October 2007 and pay only R 40.00. All registrations from Thursday 4 October will be R 50.00. 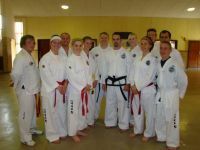 On Saturday 30 June 2007, 3 colour belt students from ATC graded to 1st Degree black belt and 1 student to 3rd Degree Black belt. 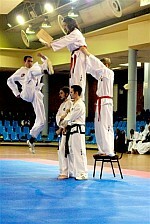 They were graded by 7th Degree Black belt, Master Kim Jong Su. It’s with great pleasure that we congratulate them in achieving this milestone! 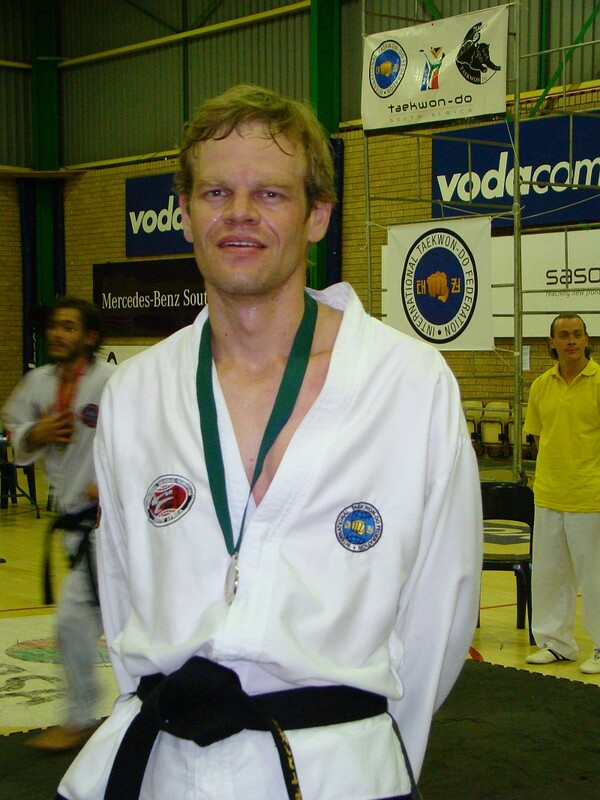 Stephan Maritz graded to 3rd Degree black belt, Jan Botha graded to 1st Degree black belt, Jaco Botha graded to 1st Degree black belt and Bernard Els graded to 1st Degree black belt. Congratulations, we’re all very proud of you! Once again it was that time of the year, for all Taekwon-Do students, and in some cases instructors, to engage in a competition of note! 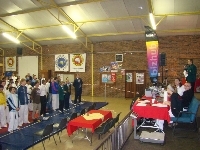 The 6th ATC Invitational Tournament took place on Saturday 12 May 2007 at the North Gauteng Wrestling Hall in Menlo Park, Pretoria. Students and instructors from as far Zimbabwe traveled to Pretoria to participate. The tournament was a great success and we would like to take this opportunity to thank Millennium Minolta for sponsoring the medals, trophies and water bottles that were handed out on the day at the tournament! The 15th ITF Senior World Championships took place from 24 to 29 April 2007 in the beautiful town of Bled in the North Western part of Slovenia. With this town celebrating it’s 1000th year birthday in 2004, the scenery was truly breath taking, with castles and buildings dating back as early as the 1st century. Bled is well known for it’s fresh water lake with a church on an island in the lake, and the town is also surrounded by the Julian Alps! With 72 countries present at the World Championships, the tournament was set to be very tough with a high standard of competition. Patterns, sparring, power breaking, special techniques and self defense routines were the divisions in which were participated. 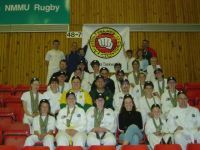 Although the South African team did not win any medals, the experience brought back from this great event, is both beneficial to the future South African team members and current Taekwon-Do students. 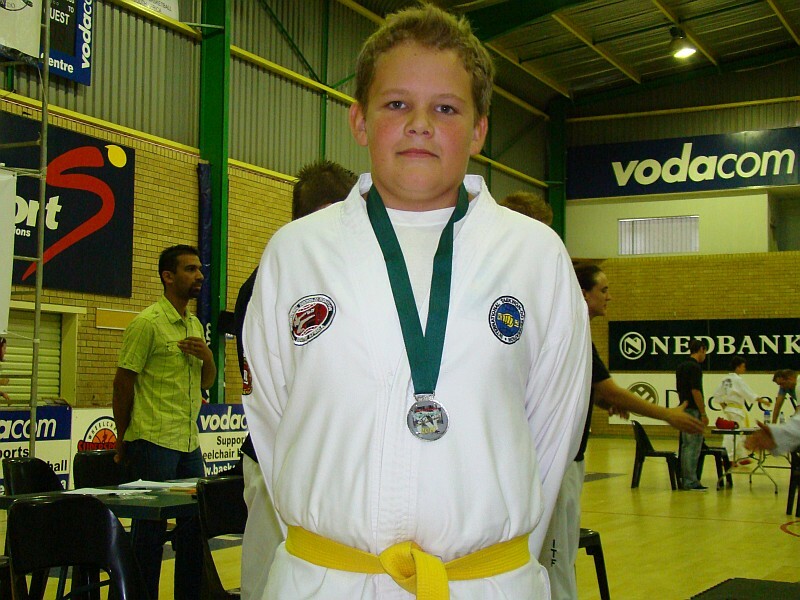 From our club Jacques van Deventer participated in individual male sparring for weight division +85kg. He won the first round against USA and lost the second round to Bulgaria. Jacques also participated in the male team power breaking and did the team’s qualifier break with turning kick, which he broke successfully. Stephan Maritz and Jacques van Deventer were the 2 attackers for the South African Female Self Defense routine. Karel Wethmar participated in the individual male power breaking and qualified with turning kick, breaking the boards successfully. He ended 9th overall. 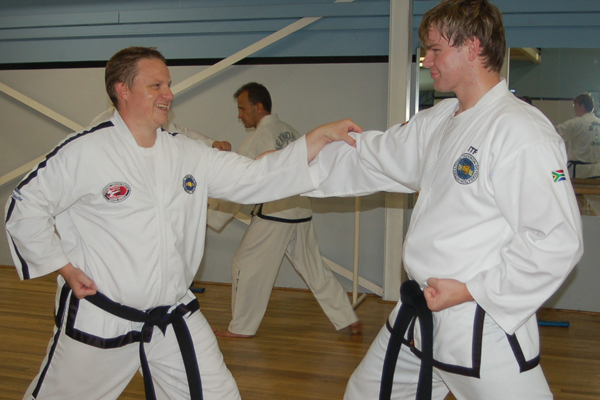 With the next World Championships scheduled for St. Petersburg, Russia in 2009, the club’s black belts are already looking forward to the selections! You can feel it in the air. In big cities and small villages all over the world sparring gear is getting dusted down. It's the 6th Annual ATC Invitational Tournament and it's going to be a BIG one. Join us on 12th May 2007 in Pretoria at the North Gauteng Wrestling Hall, Menlo Park. All ages and belt levels from yellow stripe up to and including 4th Degree black belts are welcome to enter. Divisions in sparring and patterns will be contested on the day, with floating trophies to be awarded to the best male and female in the under 13 years, 14 to 17 years, 18 to 34 years and the 35 years and above categories. 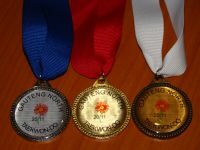 Gold, silver and bronze medals will be awarded to the winners of each category. 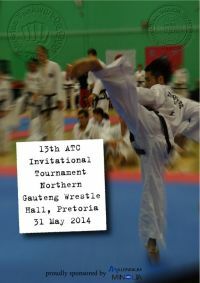 For more information contact the tournament organizers Karel and Annari Wethmar at +27 83 236 3545 or +27 83 231 2228 respectively, or via e-mail at info@atctaekwondo.co.za. Entries close on 11 May. 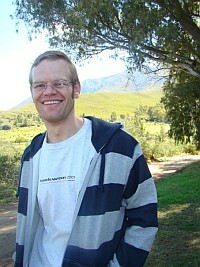 Jacques van Deventer (1st Degree). We are very proud of you all and hope that you and the rest of the Protea team will do Taekwon-Do in South Africa and our country proud. William Shakespeare said that “the course of true love never did run smooth”, which was certainly the case at the ATC’s Valentine’s Class on 13 February. Everyone got into the spirit of things by dressing according to the theme of the special day. People were decked out in red shirts and boxers, while others enthusiastically painted hearts on their faces. 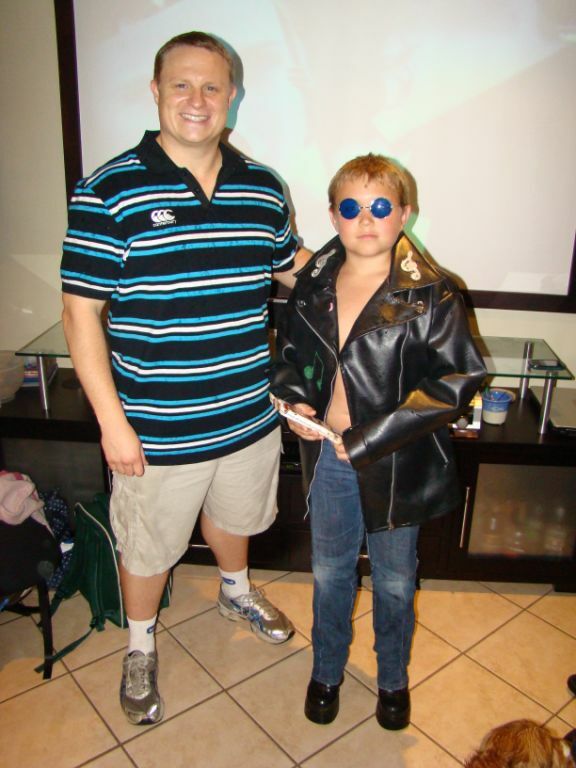 A competition was held for the best dressed and the deserving winner was Stefan Maritz, whose “crowning” glory was definitely the heart shaved into his hair. 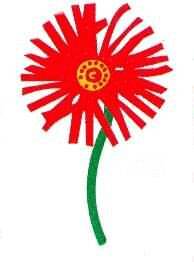 After everyone had shown off their creations, four teams were formed: die Mieliestronke, the Mwah (evil laugh) team, die Bye en Blomme and Pertivis. Boosabums Karel and Annari Wethmar led everyone through an exciting class of games and war cries. There was much excitement and commotion as the games proceeded, particularly as teams amiably argued about who had won a specific round. The games included kicking balloons, skipping ropes and bouncing balls and allowed everyone to remain active, with fun and laughter remaining the ultimate goal. The spirit remained high throughout the evening as the teams repeatedly sang their war cries, regardless of whether or not they had won. The upbeat mood was assisted by the constant supply of chocolates and sweets. It was altogether a successful and enjoyable evening, getting everyone into the right mood for the following day. 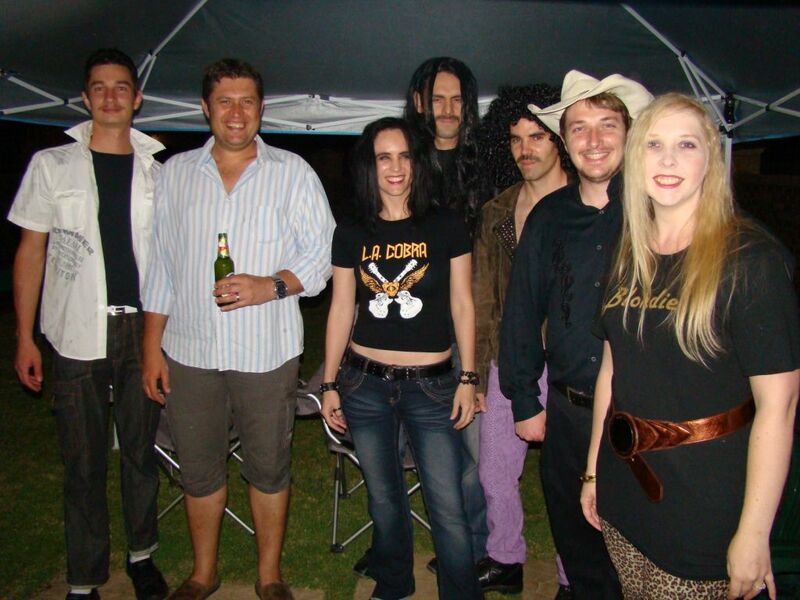 On Friday 24 November 2006, the ATC end of the year function took place at Rocky Ridge Estate, Pretoria North. The function took on the form of a theme, where everyone had to dress based on any theme as long as the theme started with the letter “A”. From Apache, Austin Powers and Asterix to Aragon and Arabella, from athlete, alien, Afrikaner, artist, Aspoestertjie (Afrikaans for Cinderella) to Audrey Hepburn, from Acestes to Alexandra, Queen of Russia, everyone went that extra mile to ensure that they were transformed into their selected theme on this evening. Prizes were handed out to 4 best dressed students. After a short welcome and look back at the past year’s events in which ATC took part and the students excelled in, the function got under way. The year-end prize giving also formed part of this gala event. The club’s annual floating trophies were awarded to the victors (see details under “roll of honour”, and “annual awards”), and many a person was thanked for their great effort and contributions during the year. Without all of you this year would not have been so successful! After the prize giving everyone enjoyed themselves with the braai that followed and the rest of the evening were enjoyed with a dance till late. The mention of the name London conjures up a myriad of different images: An old colonial power where people enjoy high tea at four a clock in the afternoon, a modern city where black is so last season and where black is the new black, a stuffy underground, black taxi’s, Big Ben standing sentinel over the Houses of Parliament, red busses…However, having spend almost three months in London, I realised that none of these stereotypes nearly match the reality and the privilege to work, live and train Taekwon-Do in the largest city in Europe. The first thing one notice in London is the diversity of people and cultures that inhabit this magnificent city on the Thames. It seems to be the melting pot of cultures, communities and different ideas. Each day one is confronted with a new point of view, whether it is on politics or religion or morality and one quickly realised that respect for one another in such a diverse society is of the utmost importance. I arrived in London carrying a huge suitcase of black clothing, eagerly anticipating a new experience. Using the internet I contacted a couple of ITF schools but only one of the instructors replied, Sabum Thomas Denis, 6th degree and the ITF-England National Team Coach and ITF Instructor. He invited me to train at his two clubs in Docklands and in Pimlico, free of charge. New ATC black belts on the block! 3 Students from ATC were invited to attend the black belt grading under 7th Degree, Master Kim Jong Su, on Saturday 11 November 2006. It’s with great joy that we announce that they have passed their grading! Karlien Els graded to 1st Degree black belt. The 4th SA-ITF Gauteng tournament was held on Saturday 4th of November in Primrose, Johannesburg. Altough it is exam time the tournament was well supported by clubs and students from all over Pretoria, Johannesburg and the Vaal River. Well done to the ATC students that participated at the tournament. 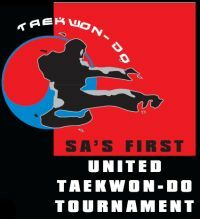 The first ever United Taekwon-Do Tournament was held on 15 October 2006, in the Nelson Mandela Square, Sandton, Johannesburg. 3 Federations, namely the SA-ITF, TSA and GTF, participated against each other in a well organized and spirited tournament in Sandton. The ITF sparring rules and patterns as designed by General Choi Hong Hi governed the events on the day. 12 ATC students from all 3 dojangs, formed part of the SA-ITF team that took part in the event. A total of 14 medals were coupled in by the ATC students with 5 Gold, 4 Silver and 5 Bronze. 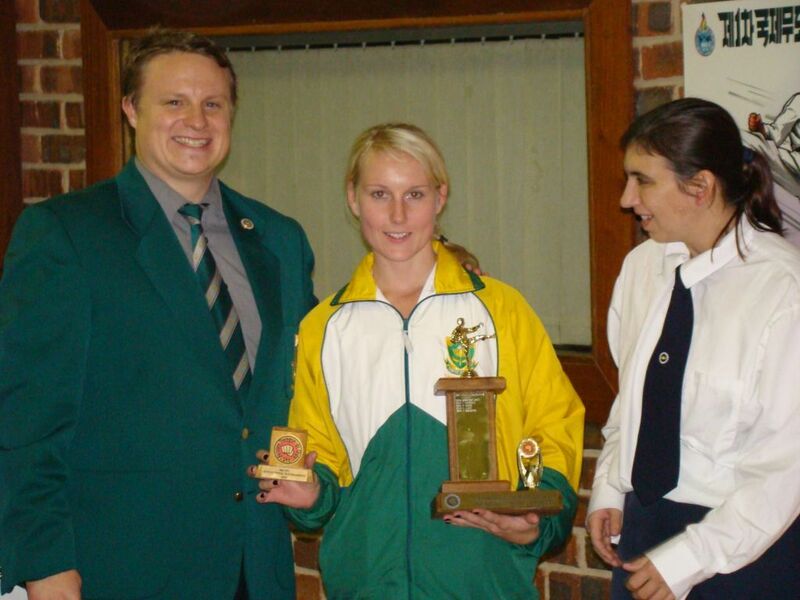 Chief instructor receives award at 2006 SA Champs! We congratulate our chief instructor, Bsb Karel Wethmar, on receiving the Courtesy and Integrity award at the 2006 SA Champs. Thank you Bsb Karel, it is truly an honour to train under you. 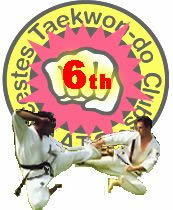 Acestes Taekwon-Do Clubs really appreciate your courtesy and integrity. ATC would like to take the opportunity to thank BlackApple IT Solutions for the financial sponsorship received, which was distributed equally to all participating ATC students at the 2006 SA Championships in Port Elizabeth. Further we would like to thank BlackApple for the sponsorship of the caps. All the ATC students stood out with their caps on! 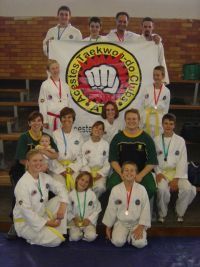 Acestes Taekwon-Do Clubs (ATC) was the overall winner of the 2006 SA Champs, held in Port Elizabeth, with a total of 201 points. 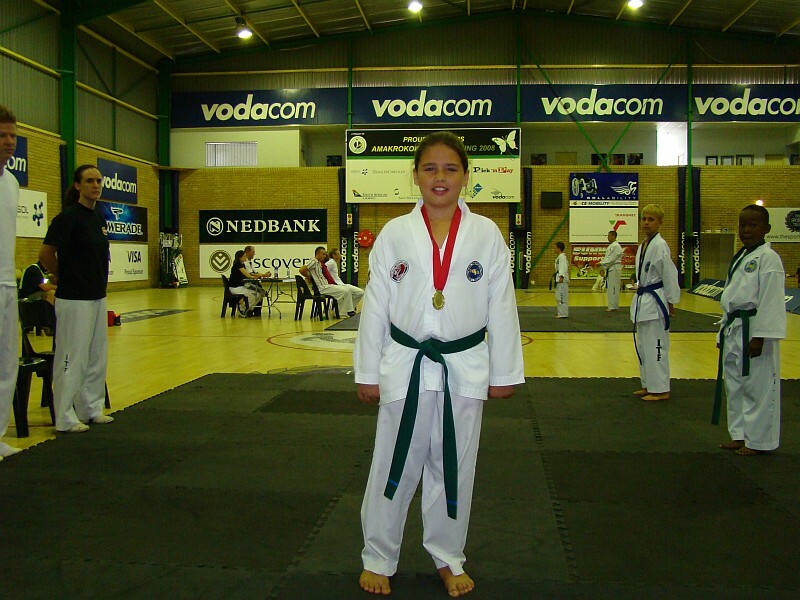 Phoenix Taekwon-Do Clubs from Port Elizabeth got the closest with 197 points. Well done everyone, you all rock! We couldn’t have done it without our incredibly adorable and cute mascot Anel. This was the 3rd year in a row that the Acestes Taekwon-Do Clubs have won this prestigious award, by accumulating the most points at the National Championships. All in all, the club managed to accumulate a total of 59 medals at the tournament, spread between 23 gold, 25 silver and 11 bronze medals. After an early morning of waking up, no wait a very early morning, and after a long drive, we all at last arrived safely in the gorgeous Port Elizabeth (PE). Of course some of our students had the luxury of flying a day earlier. I must admit, the road trip was great fun! 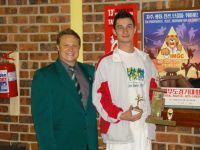 The 3rd SA-ITF Gauteng tournament was held on Saturday 26th of August in Primrose, Johannesburg. 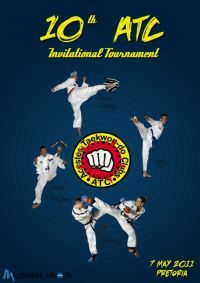 This tournament not only catered for individual patterns and sparring, but also for team events. The tournament was a great success! 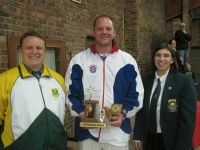 The 2nd SA-ITF Gauteng tournament was held on Saturday 5th of August in Primrose, Johannesburg. ATC attended the tournament represented by all 3 dojangs, Cullinan, Elardus Park and Silverton. 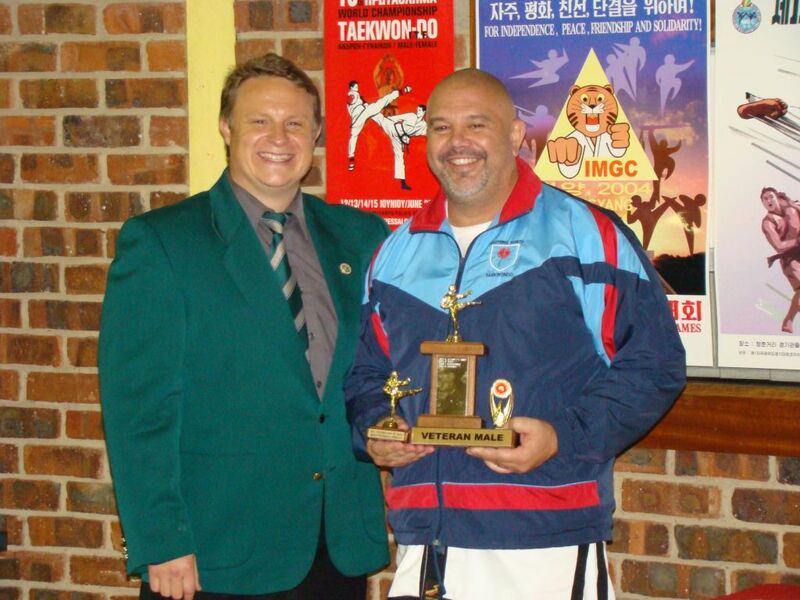 The monthly Gauteng Tournaments were the initiative of 7th Degree Black belt, Master Kim Jong Su from DPR of Korea. Once again ATC decided to test strength against strength. On Saturday 22nd July 2006, we held our second Interdo-jang Tournament. All ATC do-jangs (Silverton, Elardus Park and Cullinan) were present and ready to strut their stuff. Fun prevailed on the day as every competitor was given the chance to compete against one another, regardless age and gender or anything else. This provided for great entertainment and was a huge learning curve for all. The competition included patterns, sparring and power breaking. Control in sparring played the most important role and off course patterns required and asked for the usual : concentration and the memory of an elephant. Fitness was also put to test – after doing your patterns for the 20th time you also acquire a very different breath control, as there’s no more breath left, to control. The importance of conditioning was also quickly realized in power breaking as well and correct technique. Afterwards we had a little social gathering and braai, and all could discuss the past day’s participation against one another. All and all the competition was amazingly fun and everyone learned quite a lot on the day – my lesson : don’t wear a dobok that’s too big, when you accidentally step on your pants, it give new meaning to “side split”. Can’t wait for the next Tournament! The Annual SA-ITF National camp was held over the weekend of 28 to 30 April 2006, at the Sikelele Adventure village, close to Rustenburg in the North West province. 4 ATC students, Jan Botha, Ruard Joubert, Sean Young and Alta Roets attended the camp at the Sikele Adventure camp and the 2 chief instructors, Bsb Karel & Bsb Annari Wethmar as well as Bsb Chris van der Merwe, also attended the SA-ITF Annual General Meeting on the Sunday. From good food to comfortable accommodation and awesome training with our Korean instructors, this was most definitely one of the best camps to date! The opportunity to train under Master Kim and Sabum Kim was great, with so much learning opportunities, and still so much to be learnt from them. The camp primarily focused on techniques, patterns and sparring. Playing soccer and line sparring was, to name but a few, daily activities that made it a great camp. On the last day, while Jan was part of the senior grading under 7th Degree Master Kim Jong Su, the rest of us were kept busy with some fitness training. This was also a great opportunity to get to know students better from the other clubs in the SA-ITF. Looking forward to the next one! The day to dread or love changed into something new! The 14th of February is just one of those days……you either love it or you hate it. However thanks to the intuitive thinking of two rather extraordinary individuals everyone in the Acestes Taekwondo Clubs looked forward to a great Valentine’s Day. As the second Valentine’s Class held by Acestes we proved that Martial Arts isn’t all about fighting and we had quite a large turnout from all three dojangs (Elarduspark, Silverton, Cullinan). The two individuals spoken of earlier are the instructors (Bsb nim Karel and Annari Wethmar). Rather than spending a quiet evening spoiling each other rotten they gave a Taekwondo class and spoiled us rotten! Now that is quite a combination even the ladies have to agree is good thinking: you get to eat sweets while burning it all off at the same time! Now that is what I call thinking outside the box! To start off we had a fashion show to decide who had the best attitude as well as being best dressed. The winner was picked by the panel of federation heads. Once the fashion show was finished we could get started with the class…..
We were divided into 5 groups where we had to pick a group name and a warrior cry befitting our name! This proved to be the corner stone of all the energy and team spirit felt by each and every one of us! The rules were given and we immediately started to look for shortcuts and easy ways of defeating the other teams. With each game we played the spirit grew and it built relationships between the new the old close by and faraway students. We went home not winners or losers but richer for the experience and loved by all whom participated as well as those who judged. May this tradition continue and make Valentine’s day that much more exciting EVERY YEAR!!!!! 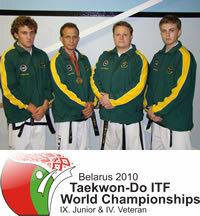 The 14th ITF Taekwon-Do World Championships were held in Caloundra, Queensland, Australia from 9 to 14 July 2005. The South African team attended this prestigious event together with the SA-ITF National coach, 7th Degree Master Kim Jong Su from DPRK. Annari Wethmar was selected as the female team captain. Karel Wethmar was selected as the SA-ITF National Team Manager. 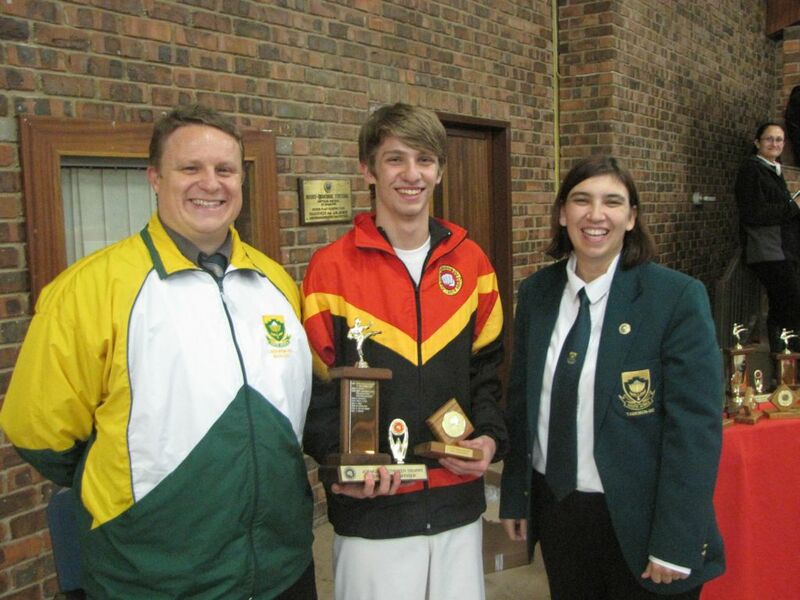 Chris van der Merwe, also from ATC, represented the SA-ITF at the International Congress, held during the World Championships. Although no medals were won by the team, a few 4th places were achieved at this World Champs. Unbelievable experience was brought back to South Africa and especially to our club and students. 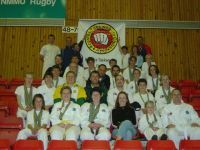 Without a doubt the clubs’ black belt members are looking forward to next selection tournaments to possibly be able to make it back onto the National Protea team for the next World Champs, scheduled for April 2007 in Slovenia. That was the question on everybody’s lips the Thursday evening on the 24th of February at the Barnyard Theatre in Menlyn Shopping Centre. Two weeks before the big night, all of the Acestes Taekwon-Do students sweat blood to sell the tickets in order to raise funds for our students who would be chosen to represent South Africa in Australia, at the 14th Taekwon-Do World Championships in July. The big night finally arrived and the hall was packed, people just kept streaming in. Of course as we all know, people who participate in sport eat quite a bit, but people who participate in Taekwon-Do eat ALOT. The smell of pizza, pasta, hamburgers etc, filled the air as you entered the great hall. Naturally, here and there you could see a beer, cider or a glass of wine being lifted as a toast – OK, more than here and there. Every student’s family was there to share in the experience. Thanks mom and dad, we deeply appreciate it, after all, you did pay for the tickets. Overall the whole evening was a blast and a huge success. We made some profit, which will be divided equally between our ATC students who were chosen to go to Australia…thank goodness – down under is quite expensive. The seller of the most tickets was Vanessa Botha, we all of course know how she did it… flirting is after all an art. Thank you to all the ATC students who took time and effort to sell the Barnyard tickets as well as a special thanks to Vanessa Botha for organizing the whole evening and to Annette Botha for helping with the arrangements. All and all, at the end of the evening a consensus was reached that Beethoven did actually rock and that too much wine is never good. 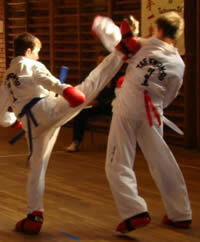 On the 14th February 2005, Acestes Taekwon-Do Clubs decided to train in an unusual way, with unusual characters. Cupids, ballerinas in bright red tutus, Casanova’s, Big spongy hearts and too much more to mention, all attended the special guidance, towards …becoming a true Valentine. This was not to be missed; of course we had some incentives… sweets! We organized ourselves into groups of about seven. This in itself was one big challenge. After every group had chosen a name, we commenced our Valentines boot camp training. I of course realized why I do Taekwon-Do and will never play soccer, and many others also came to the revelation that cheating is not ALL that bad, after all – sweets are worth cheating for. We all had such great fun, playing games and training at the same time. We still don’t really know who won that evening, but who really cares… we all got chocolates and fun out of it. Thanks to our funky instructors for making it happen. Team spirit was so high that evening, that we all really almost did have wings.